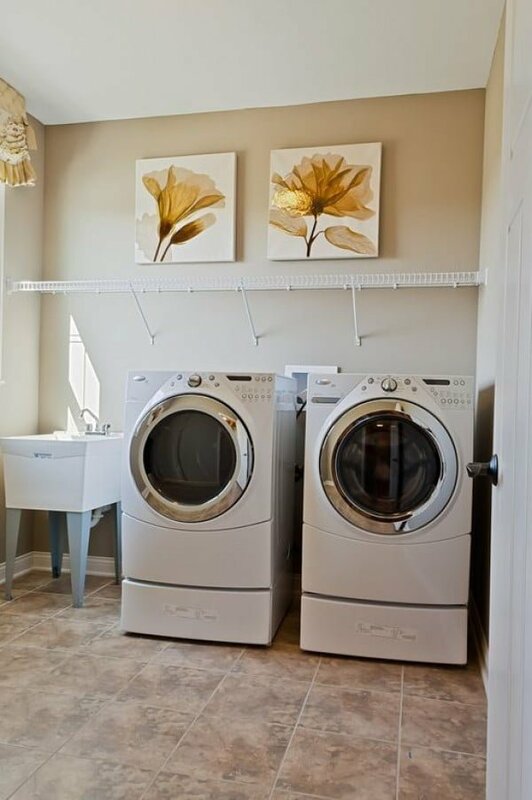 Looking for inspiration to decorate your laundry room in style? 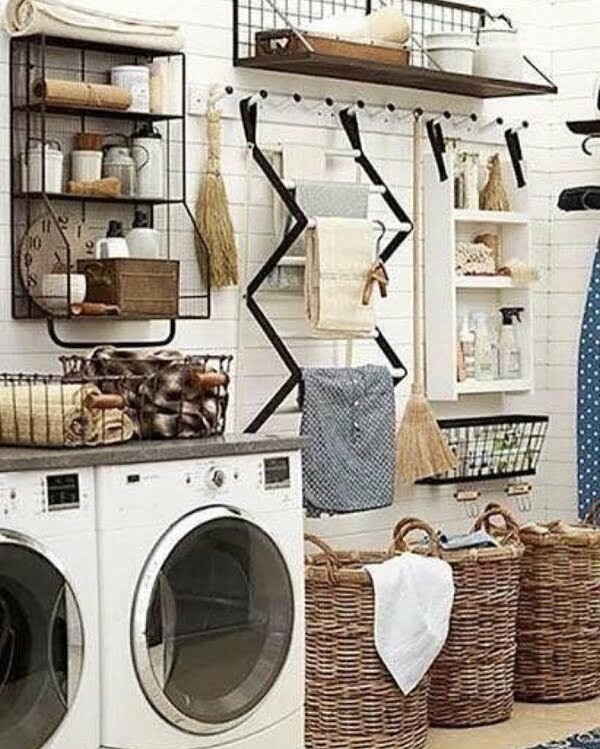 Here are 100 fabulous laundry room decor ideas that will set you on the right path. 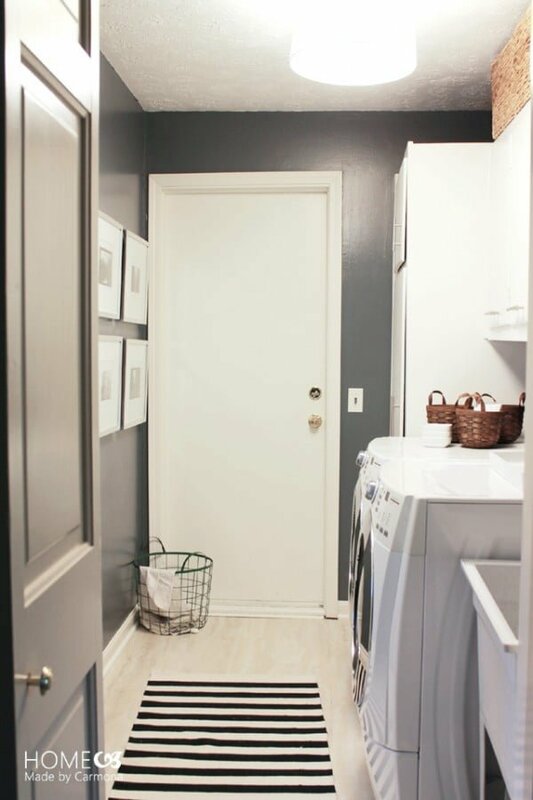 The humble laundry room has the potential to transform into a beautiful space with a bit of work and imagination. A few changes are all it takes to turn it from drab to fab. Choose an approach based on your aesthetics, budget, time and abilities. If you need a few ideas, then browse magazines or search the Web for inspiration. 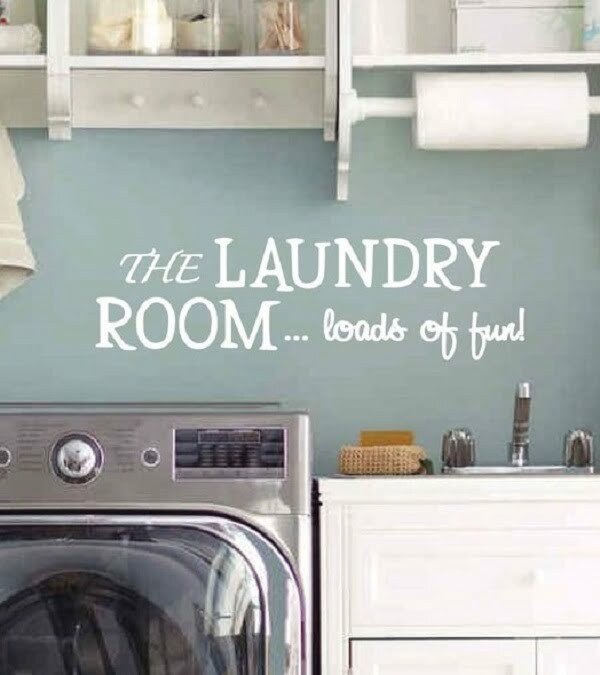 We’ve made it easier for you by compiling a list of 100 laundry room decor ideas. These examples range from minimalist arrangements to more rustic designs. Some of them may entail substantial costs. Others can be completed without spending much money. If you’re ready to see them, then let’s get started! How About Some Bulletin Board! The plain room gets a rustic overhaul thanks to the addition of a shiplap wall. Instead of actual boards, this budget-friendly project uses printed wallpaper. Shelves add vital storage space with style. 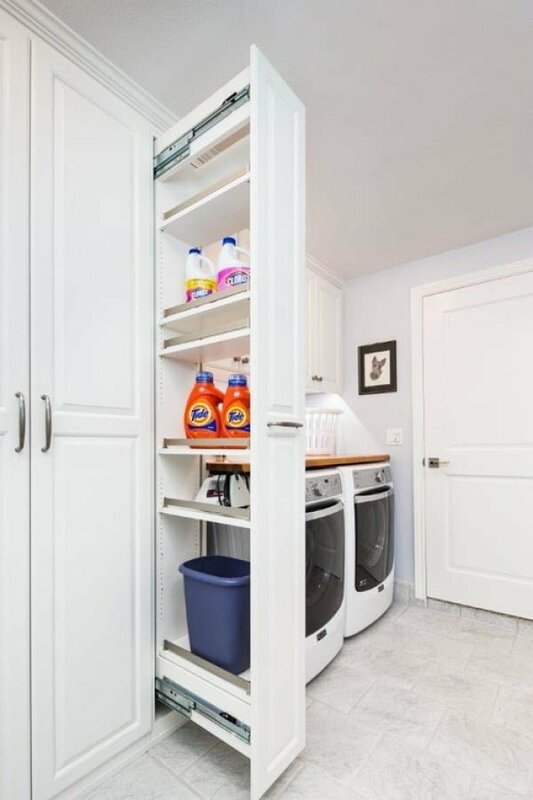 This one keeps things simple by taking all the clutter away. The Spartan space has subway tiles covering the walls up to the ceiling. The wooden shelves and rattan boxes give it a warm, homey feel. If money and space are abundant, then you may want to consider this project. 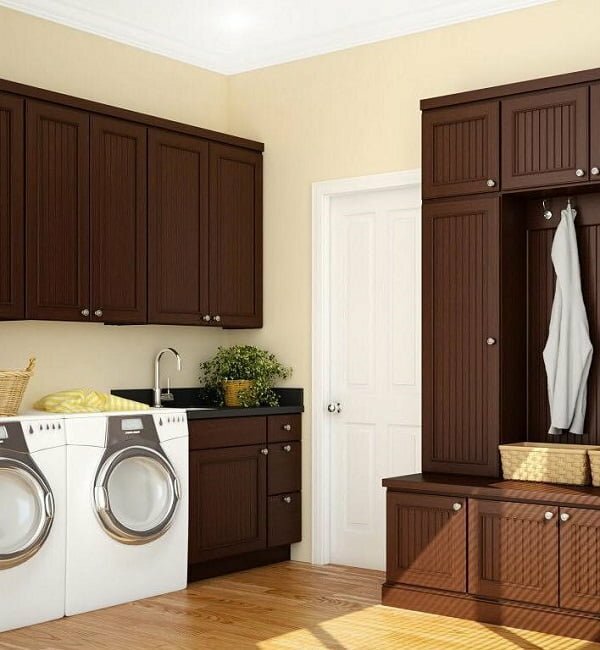 It features excellent big cabinets with a rich brown finish and elegant fixtures. A monochrome palette that creates visual interest through various textures, patterns, and shades. The marble countertop adds a touch of elegance in this otherwise useful room. Different types of décor bring this space to life including potted plants, a rattan bowl, orange towels, red circular carpet, framed images, and witty quotes. The simple wood shelf above should be easy to replicate. Socks have a way of disappearing when you need them most. 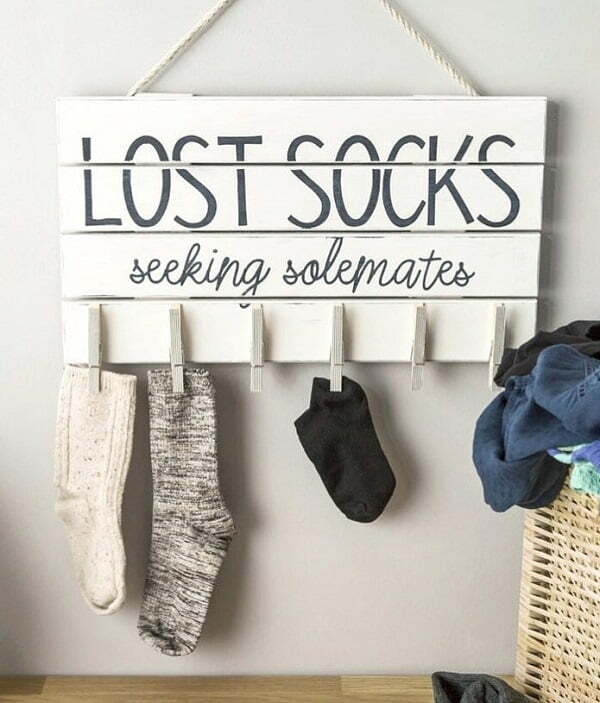 Here’s a way to keep track of the lonely ones until you find their missing pair. Hang this sign to speed up the search. Another room with shiplap walls that add character to the white surface. 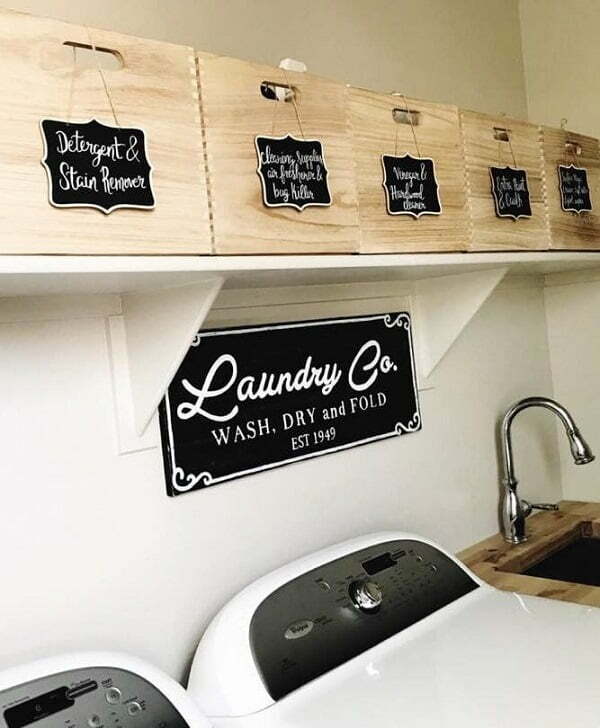 A tapestry laundry sign hangs on one side, above a wire basket, while a more prominent sign dominates the other hand. 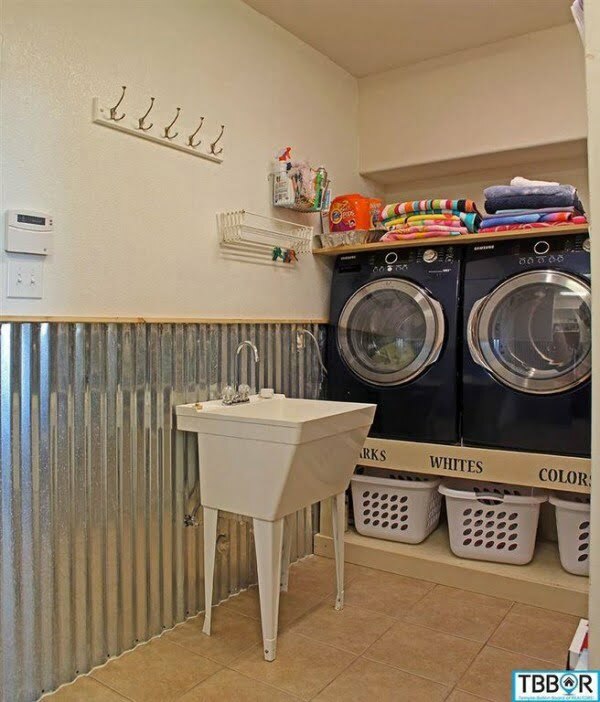 Rolled towels and mason jars sit atop a shelf. Massive safety pins make an immediate impact because of their unusual size, especially about the other items on the counter. They could be fun decorative additions or practical hook attachments. 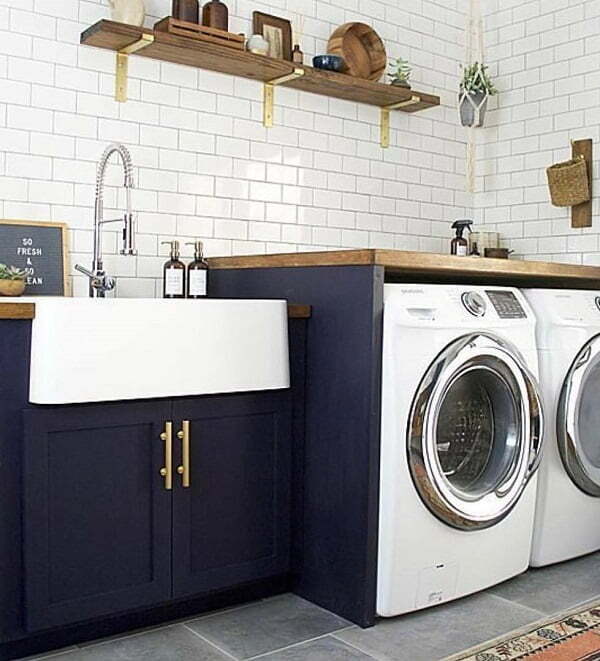 A dull laundry room can come alive with inspired add-ons. Each of the crates has their signs for laundry organization. A more prominent sign in the middle serves as the focal point. Ceramic tiles with intricate patterns can break the monotony of a plain wall, especially if they are placed around a window. Have a solid plan for selection and arrangement for a unified look. 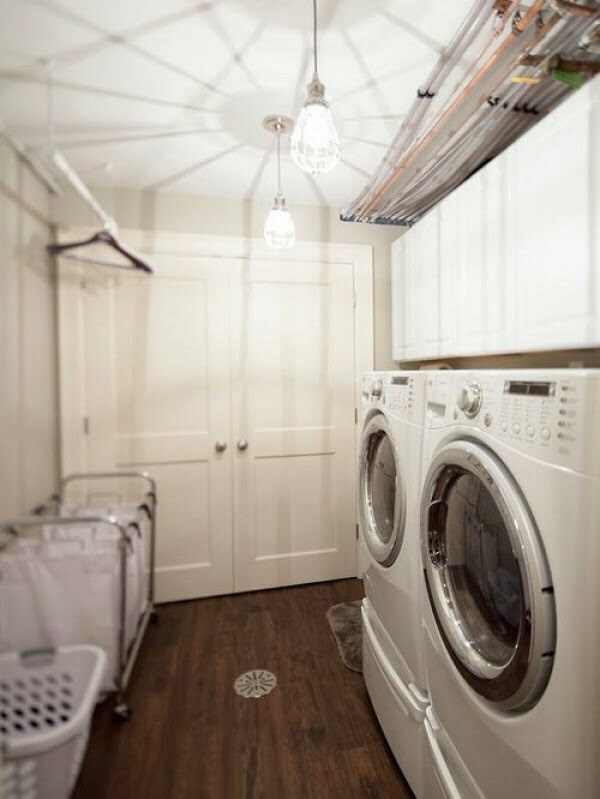 A pleasant room lessens the pain of doing laundry. Make an effort to improve the decor. In this example, stylish shelves and wooden crates with intricate carvings make an attractive sight. 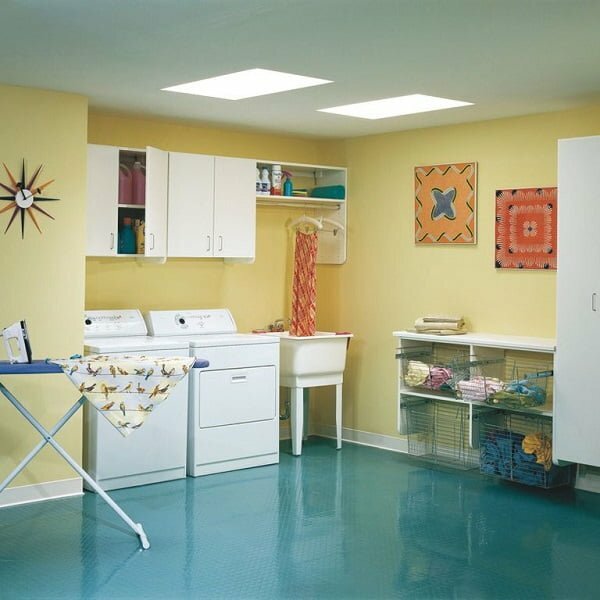 This clutter-free room features an overhead cabinet where items can be hidden away. A framed sign announces the purpose of the space while a black-and-red carpet adds a splash of color. 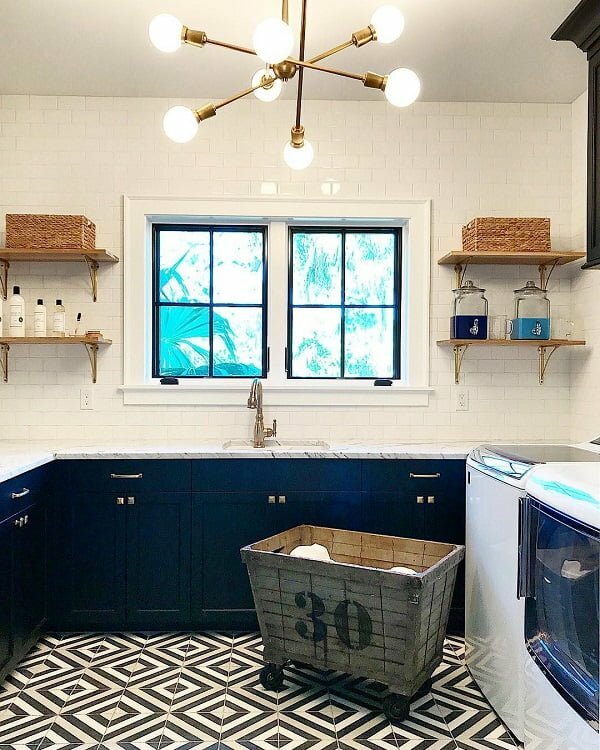 The white subway tiles serve as a backdrop for the wooden cabinet, shelf, countertop, and washing machines. The sides are painted black while the tops have a coat of varnish. Gold-plated fixtures pop out for a dash of sophistication. 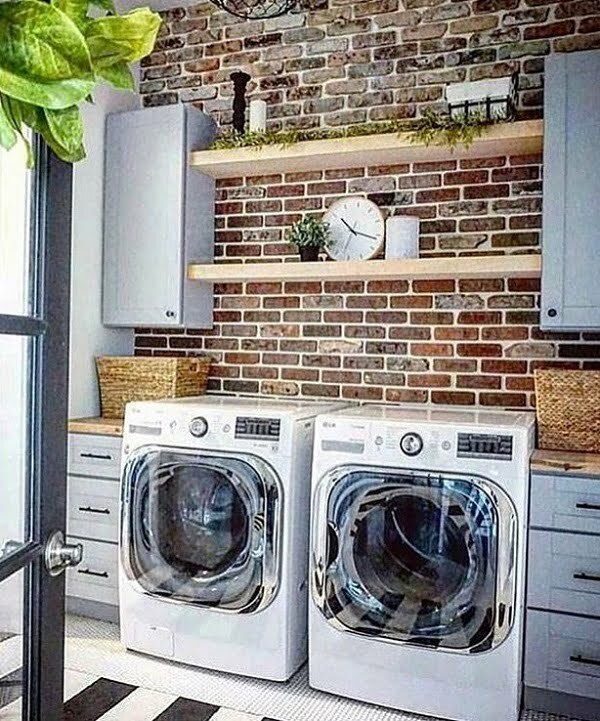 The bricks create a lovely accent wall in the background. 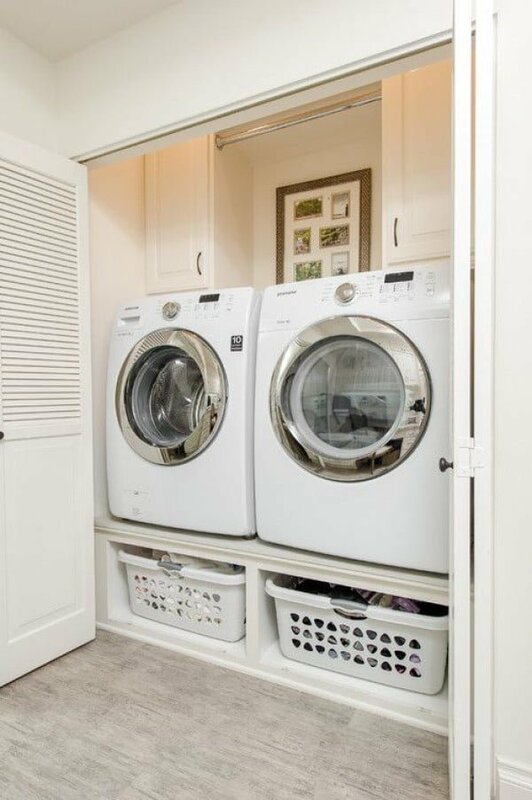 In the foreground are twin appliances and storage compartments in a symmetrical arrangement. Along with muted colors, the result is clean and ordered appearance. 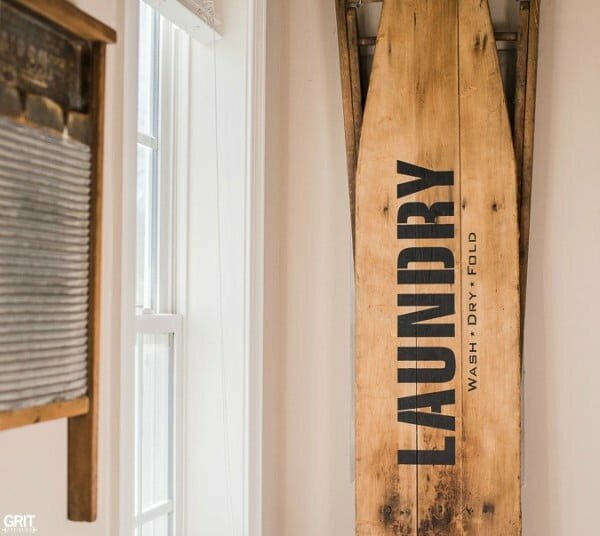 A large green sign welcomes people to the laundry room. Under it is a distressed cabinet with barnyard doors with a great deal of space inside for knickknacks. A key holder can be found on the left while a small blackboard hangs on the right. Instead of using tiles for the wall, the surface can be painted using stencils to ensure a perfect pattern throughout. This one uses interlocking hexagons, but you can substitute anything that you have in mind. Most of the spaces featured so far had white walls to make the rooms feel bigger and make decoration easier. 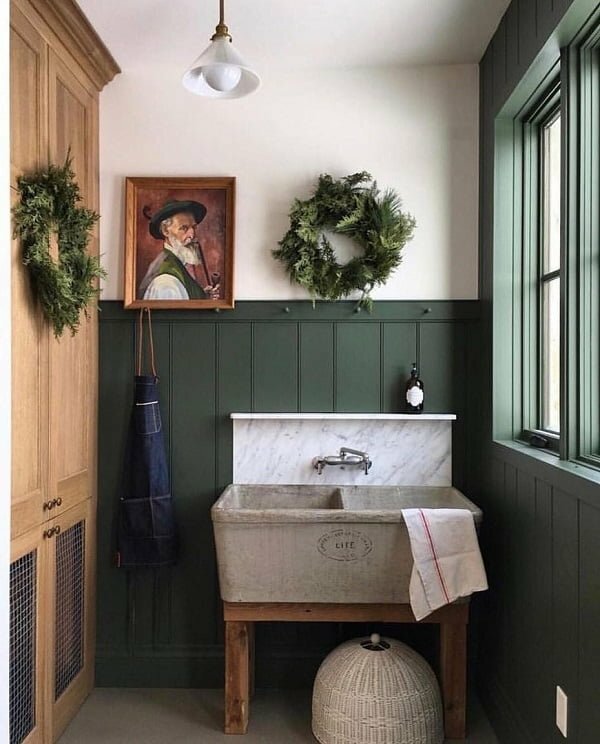 However, this should not prevent anyone from trying different hues like the dark green in this image that goes well with the hanging wreaths. 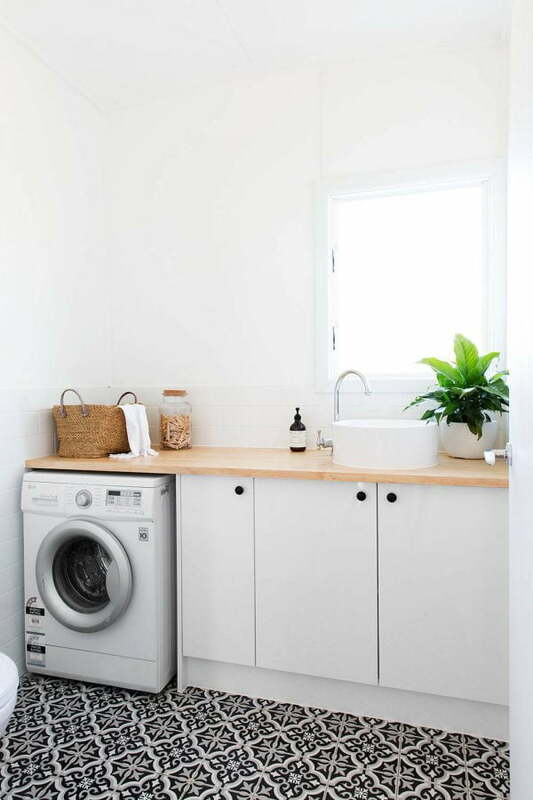 The washing machines can be moved to the outside as long as there is a nearby source for water and power. Since it’s the outdoors, plants tend to be the perfect décor in this setup. Maximize vertical space with a shelf rack. 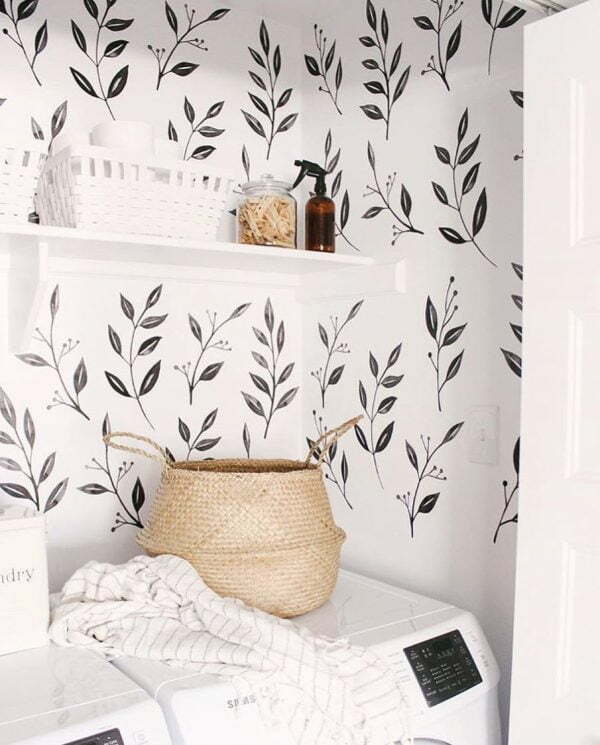 Decals are often found in bedrooms, but there’s no reason why they can’t be used elsewhere. Consider placing some in the laundry room. They could be quotes, images, or a combination of the two. Get the basics right such as a clean background, and you can pretty much accessorize to your heart’s content. Creativity can let you do so without spending much. Hang plants from the wall, use colored paper for signs, and upcycle old boxes for storage. Plants naturally give life to any space. They can be placed in the room in different ways as can be seen in the image. One is on the shelf while another is on the floor. 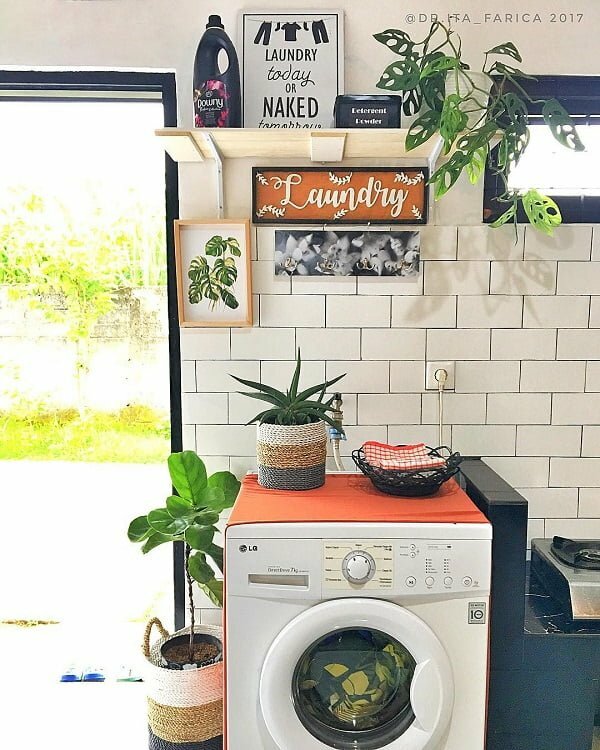 There is also a succulent plant on top of the machine and a framed picture on the wall. 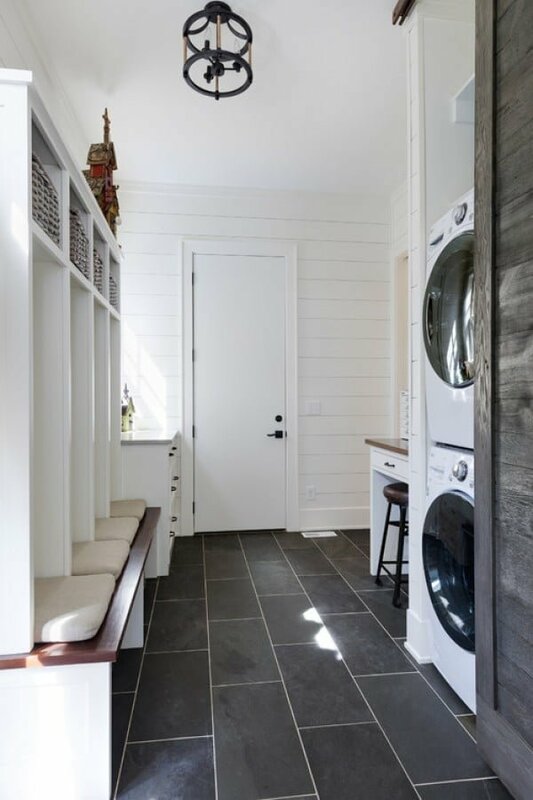 In another variation on the theme, this homeowner cut plywood into 8-inch planks to mimic the look of shiplap. It is a much cheaper way to get the same effect. 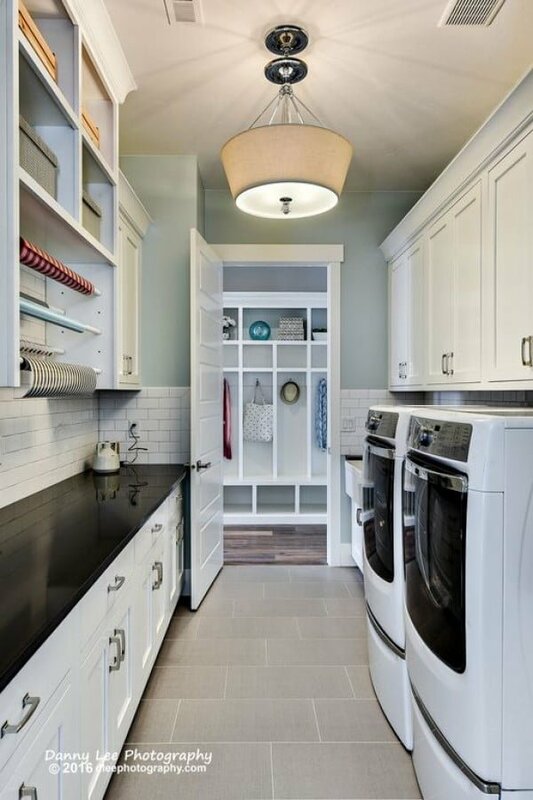 In this design, everything is anchored by the black cabinetry that provides ample storage for cleaning agents. They are sealed from above by butcher block countertops to add warmth and make space feel more like home. This space can get cluttered if you aren’t careful. 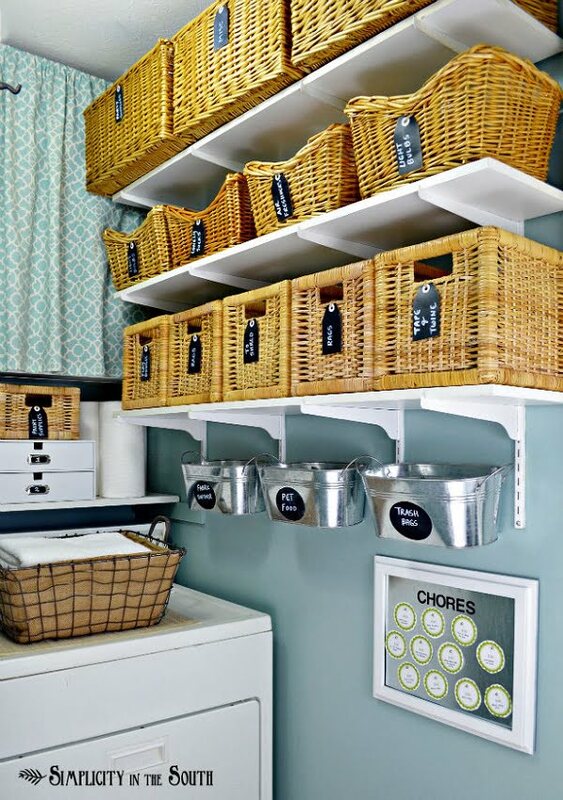 Prevent this by installing shelves, wire racks weaved baskets, hooks, and bars that will keep things organized. Designate a specific purpose for each area. 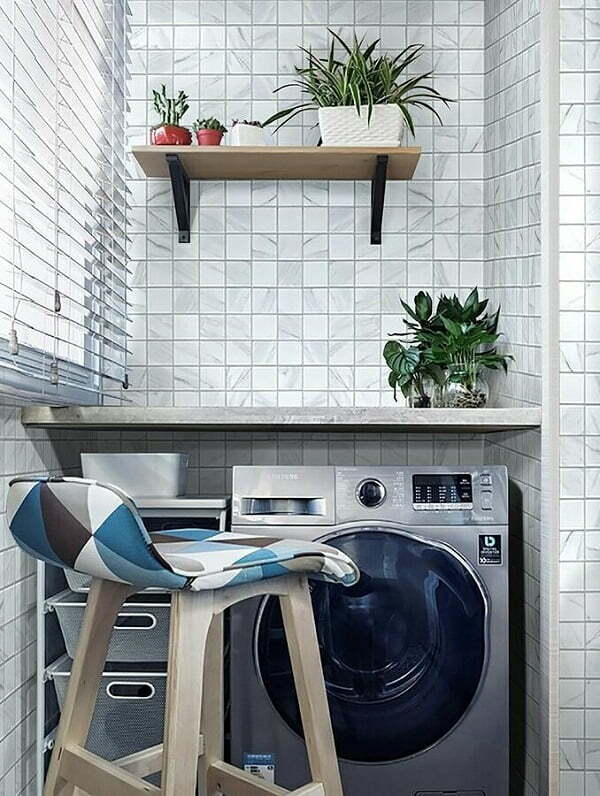 This design idea is great for small spaces that aim to make a significant impact. 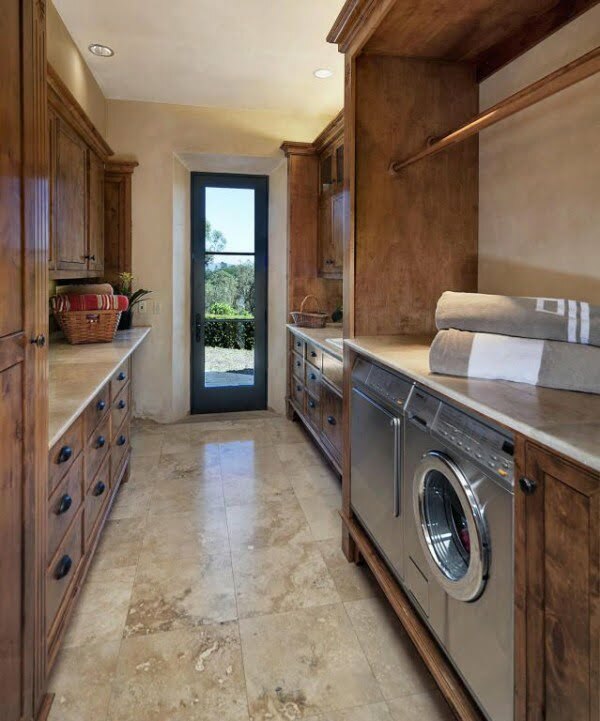 Carrara marble tile was used to cover all the walls from floor to ceiling. It can take a bit of work, but the result is simply stylish. 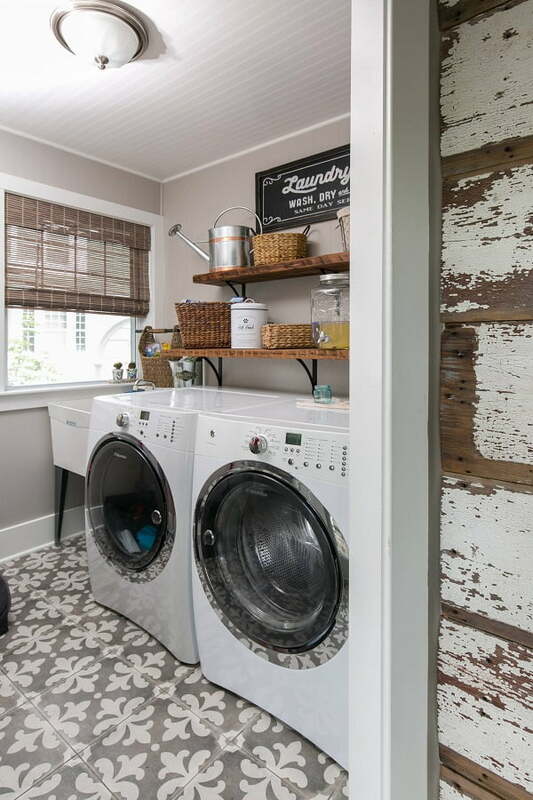 This renovation was inspired by farmhouses with its shiplap walls, distress countertop rusted pot, and old vent. Plants soften the look. The lamp provides illumination at night while the sign adds charm. Here is a room where the left and right sides are virtually identical from the cabinets down to the appliances. 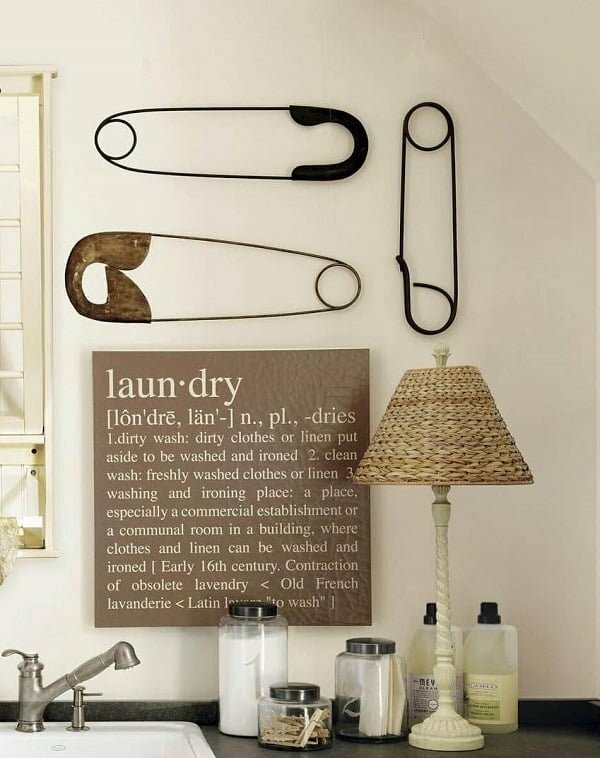 Additional points of interest include a hanging lamp, a framed canvas, a small potted plant, and a laundry sign. 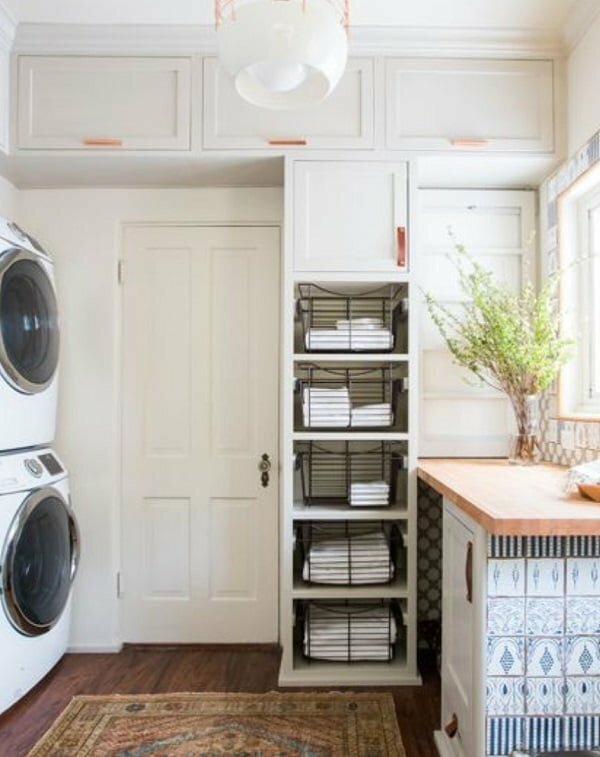 Storage space is plentiful in this small space thanks to big cabinets that run from the floor to the ceiling. 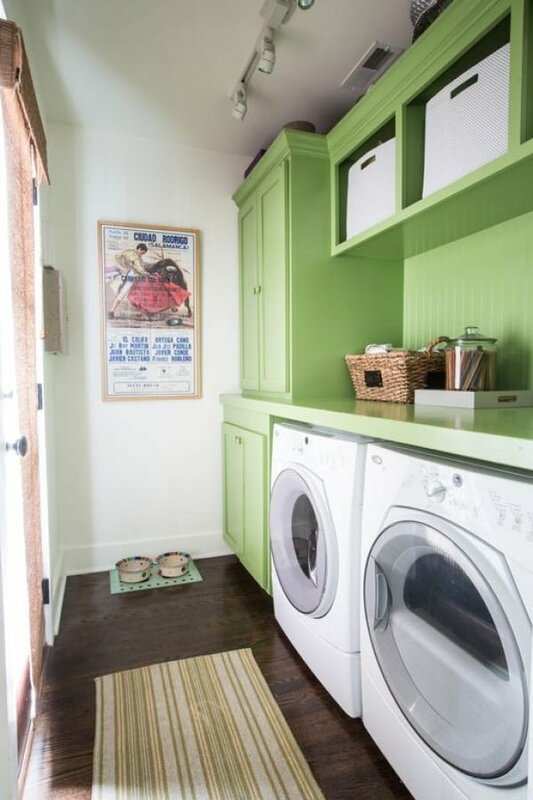 The walls are painted matte green while the cabinet interiors and countertops are bare wood. 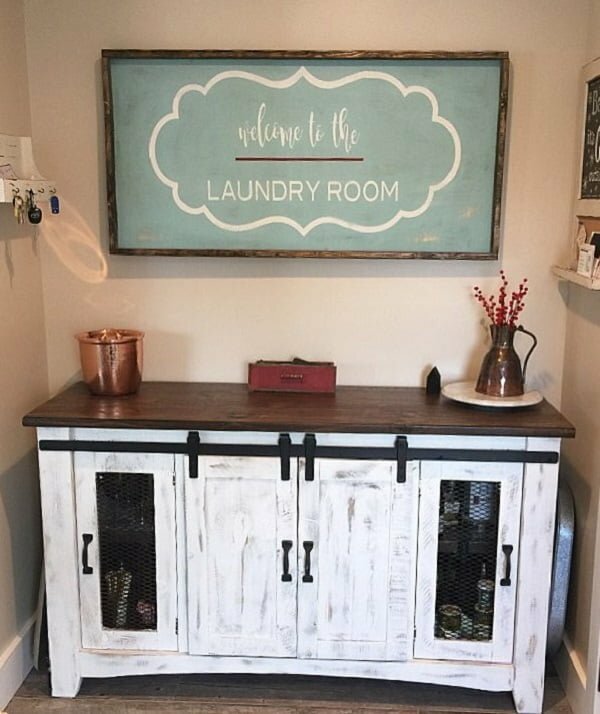 What should have been junk was plucked and repurposed for the laundry room. 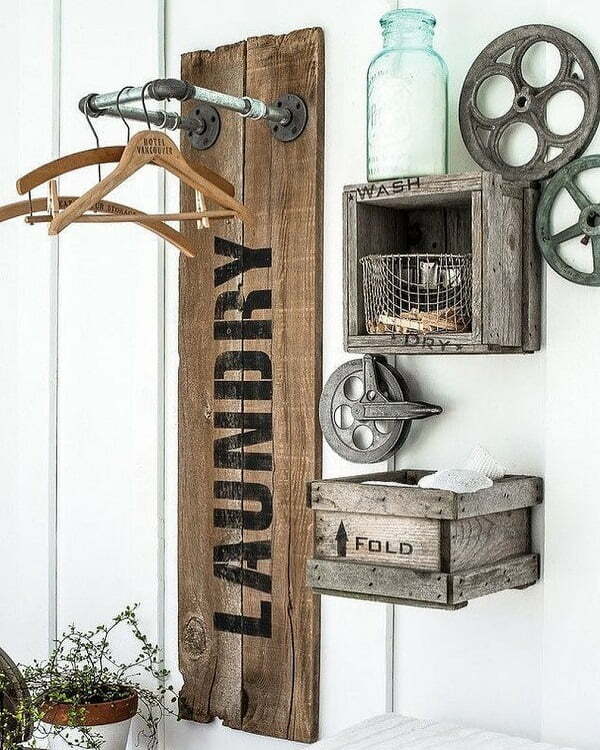 Wooden planks became a sign and small hanging shelves. Meanwhile, galvanized pipes turned into a sturdy rack. 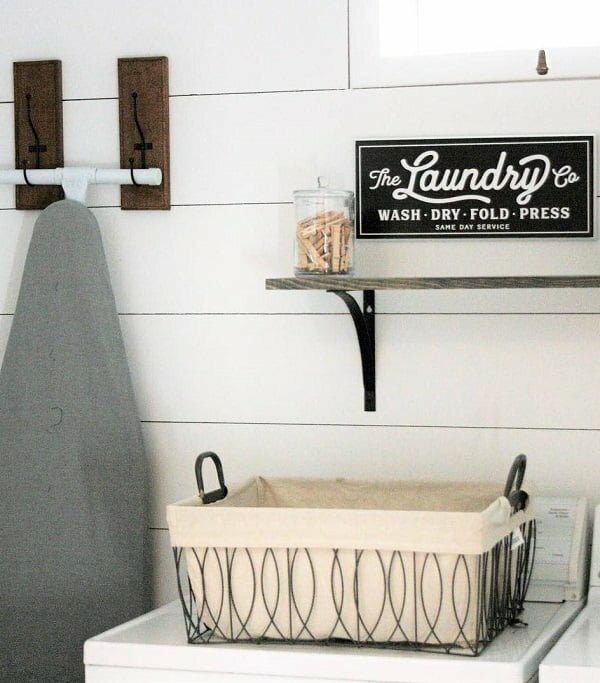 Shiplap accent wall and weathered wood sign make cute coastal style decor of this small laundry room. It just shows how a few strong accents can make stunning decor with little effort. 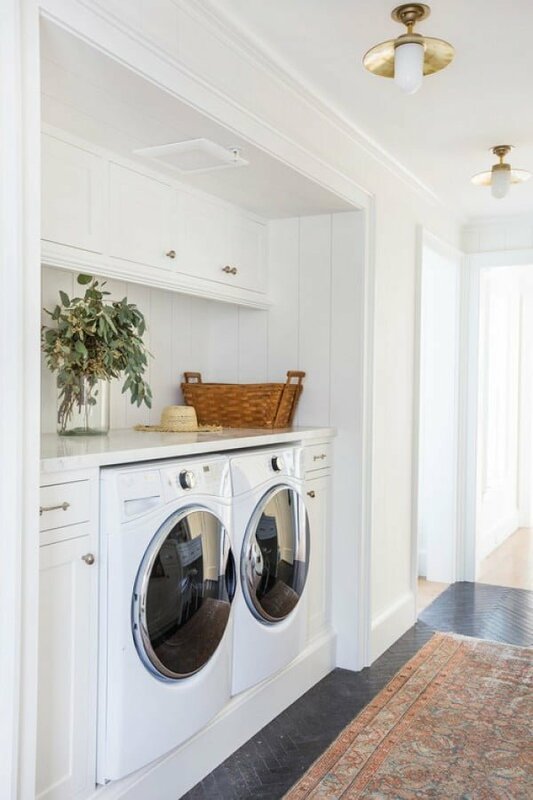 The uniform white of the décor exudes a quite elegance, at the same time keeping functionality in mind with the built-in drying racks. 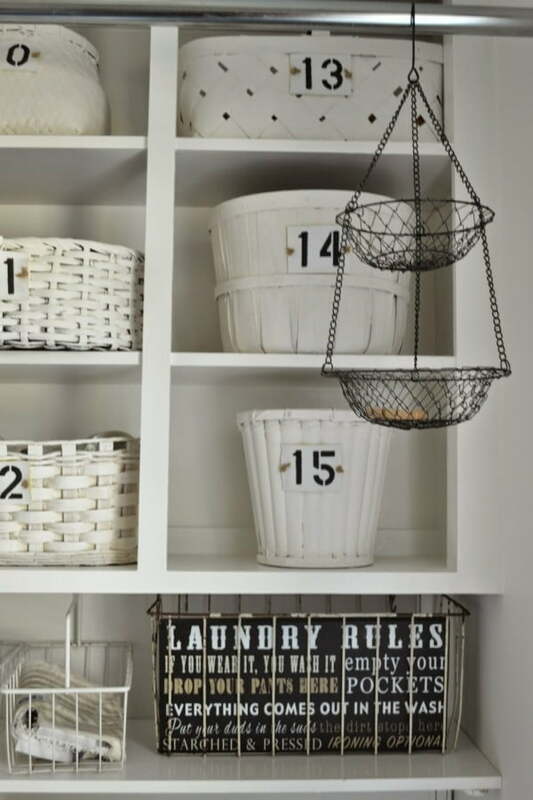 We especially love the apothecary jars for storing detergent and the flower vase. 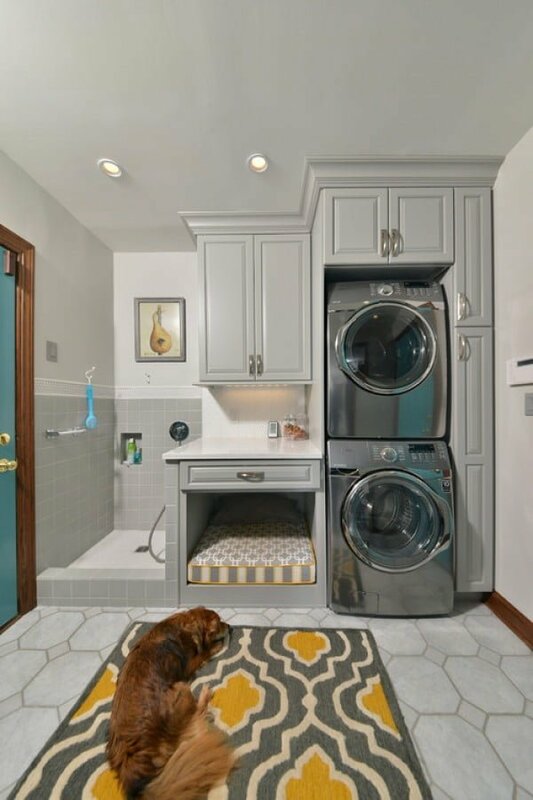 The great breakup of space with the dog wash station, relax area under the cabinet and excellent storage. Creative exploitation of all available space means you still have the scope to hang that art piece over the shower. Again, an example of what you can do with that little bit of extra space. The baskets allow you additional wall and counter space, hence the plants and the painting. 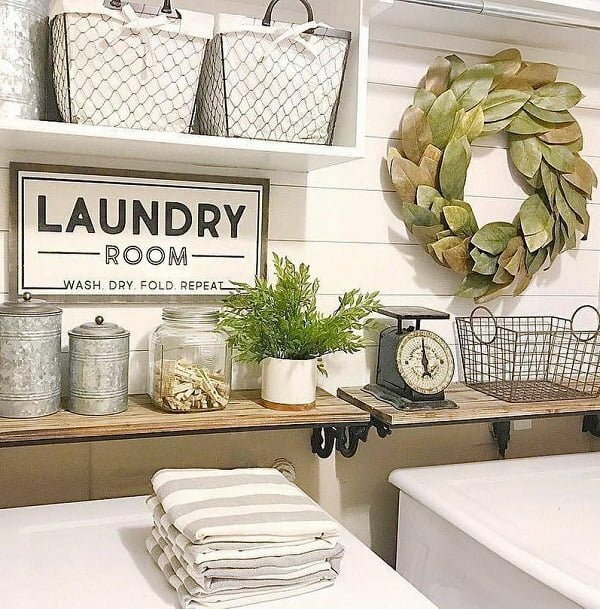 Love the accent of the storage wicker baskets and the little plant that nicely offset the rich uniform white of the décor. Notice the orderliness which is carefully crafted by using an identical series of storage options. 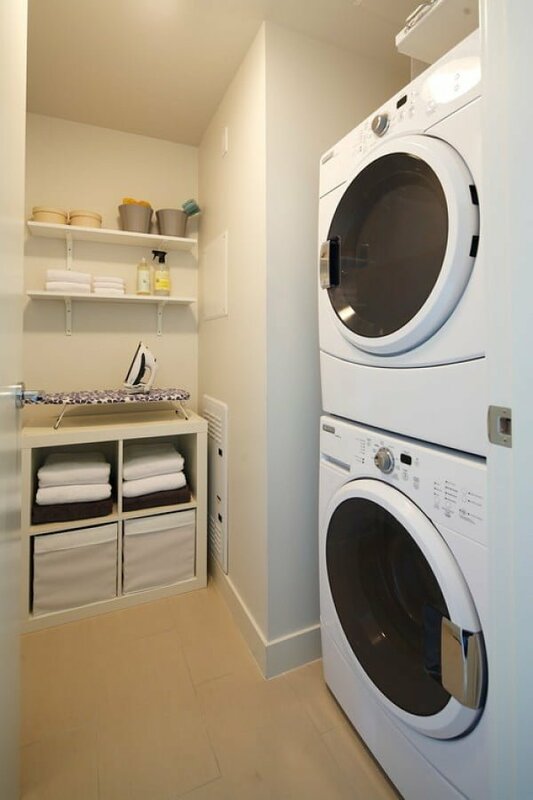 Shelved washing units also raise the level and allow easier access. The hanging nook with the hampers and the hanging bar stands out. 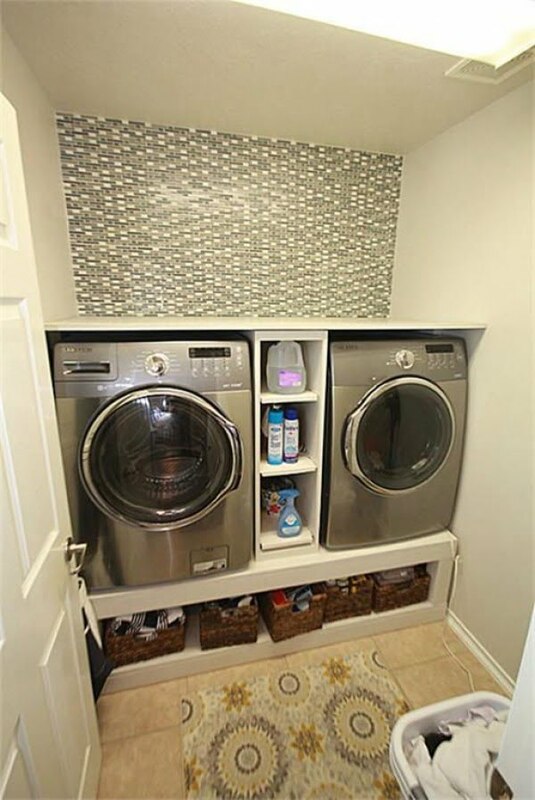 Also great storage options plus the wall-mounted dryer rack. And for all that, pretty neat and orderly. 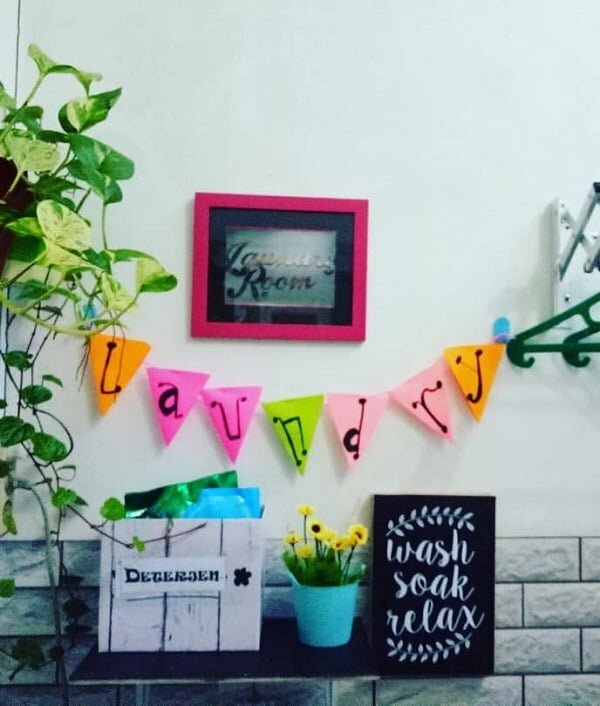 One of the most cheerful and versatile laundry spaces you may expect to come across! Great accent with the bright splashes of the rug and the hampers. And you surely haven’t missed that classic stained glass window! 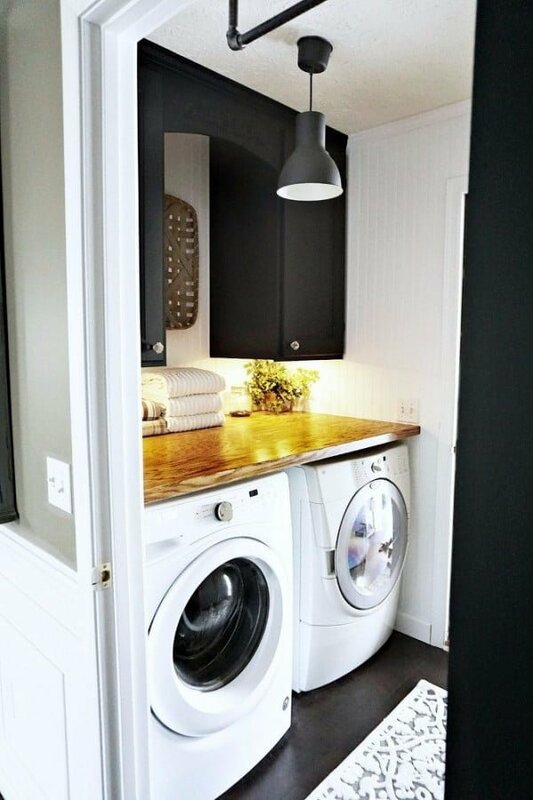 Great idea for loft or kitchen laundry. Well-covered cabinets and the doors slide out of your way once open. 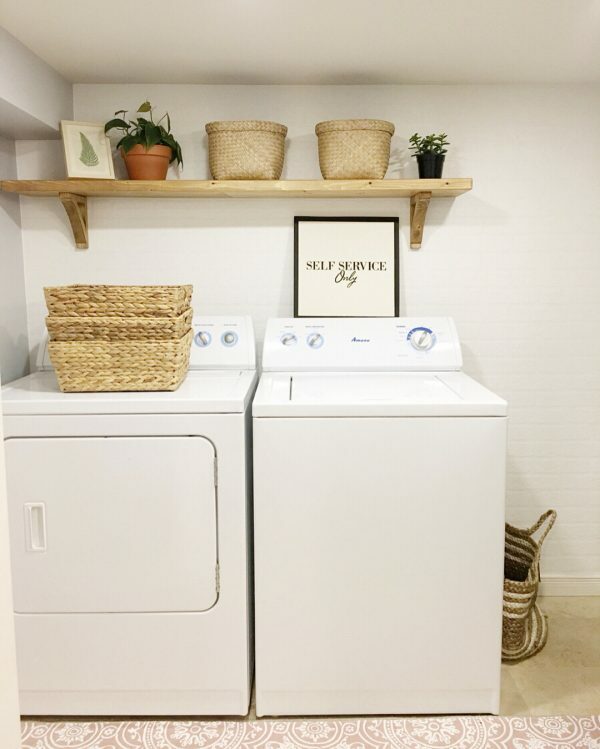 Here is what you can do with a large laundry space with double washers and dryers. Love the uniform mocha shade, the large horizontal open shelves. 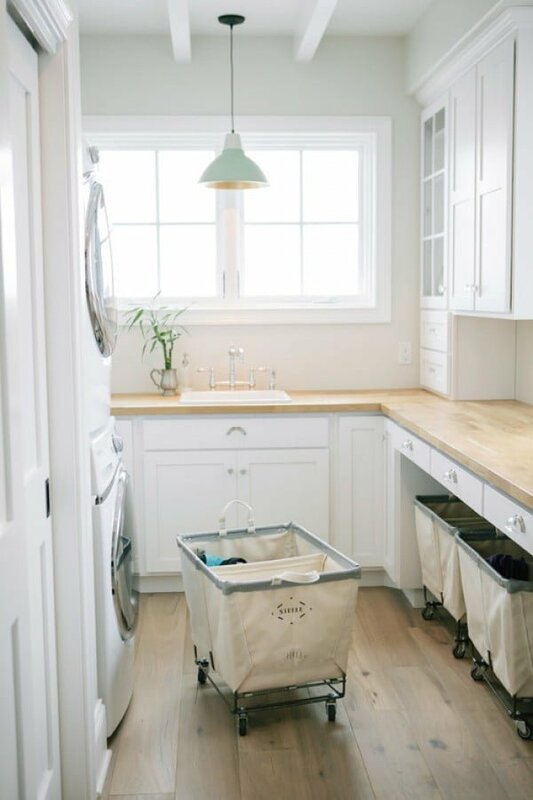 Again, a great idea that helps you craft a perfectly functional and neat-looking laundry within a small amount of space. Note the hanger bar, the raised units, and the folded doors. We love the contemporary look created with the backsplash and flushed light. 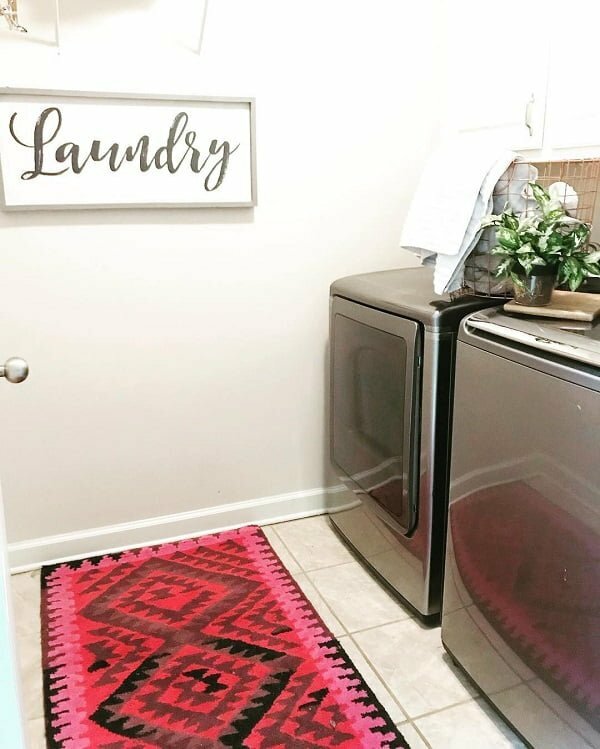 Also, the creative use of color achieved through the carefully chosen rug, storage baskets, floor tiles, and the back panel. 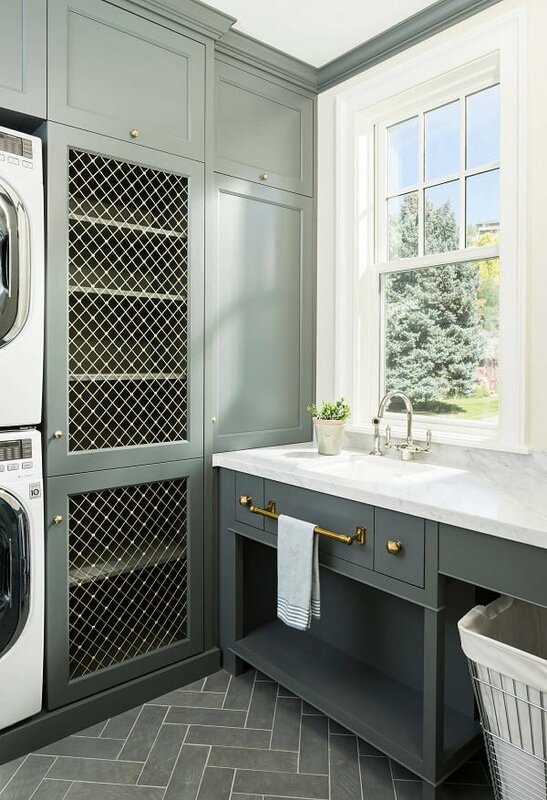 If you love grey shades, you will love this laundry room. Beautifully curated with the pendant light, the limestone floor, the plants, the floor mat, and the painting. This one is functional, but it catches the eye for its telling penchant for the creative. Note the four-legged stool sink and also how the paintings sync with the drape heading of the window from off-the-frame space. A classic look in vintage matte green with an unmistakably rustic flavor. Note the apothecary jar, the wicker basket, the walnut floor and the all too conspicuous framed Ciudad Rodrigo poster. 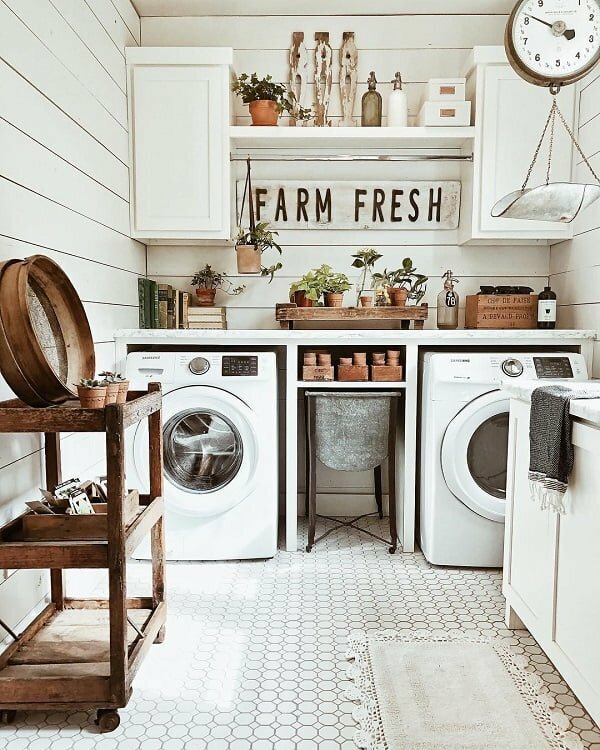 We love the carefully crafted workshop look of this laundry room – the all around syrupy wood grains mixed ingeniously with the beige tiles of the floor and the countertop. This has the aroma of melted chocolate all over it! 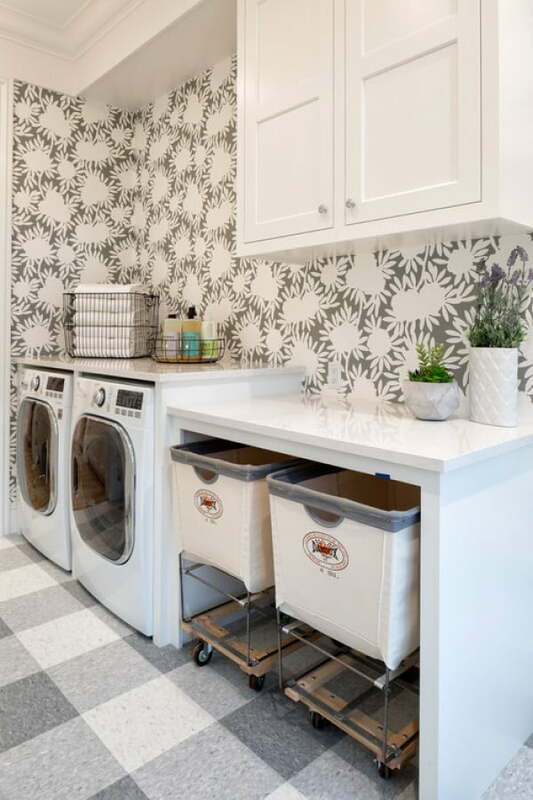 We love how the wallpaper, the tiles, the hamper, and the baskets are carefully chosen to color curate with the washing/drying units. One cannot but notice the white brick tiles as well as the large floor tiles deliberately chosen to attain a rustic look. The pendant light and the little splashes of color here and there also fit nicely with this predominantly traditional white decor. 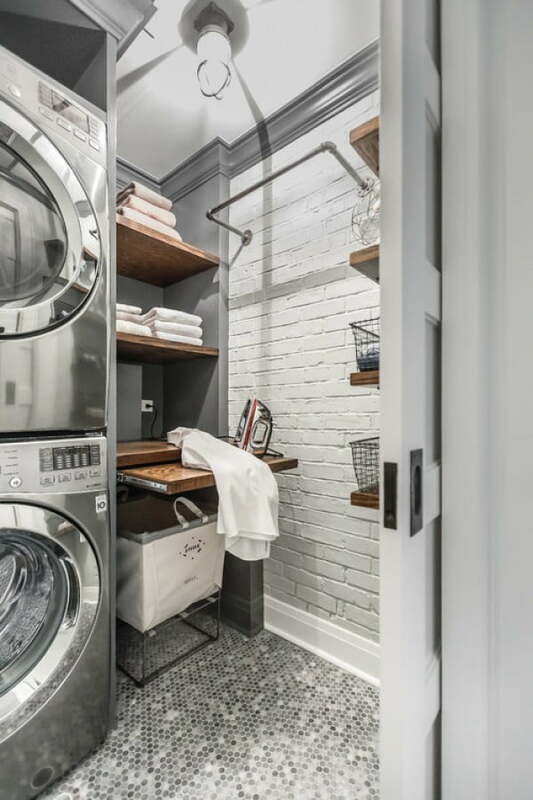 Here’s your wainscoted, limestone-tiled, industrial-looking laundry room. You either like it, or you don’t. But if you do, you will surely go for it! Visible wiring and baroque lighting mixed with the classic walnut floor. Anyone with a taste for the transitional style is sure to fall for it. 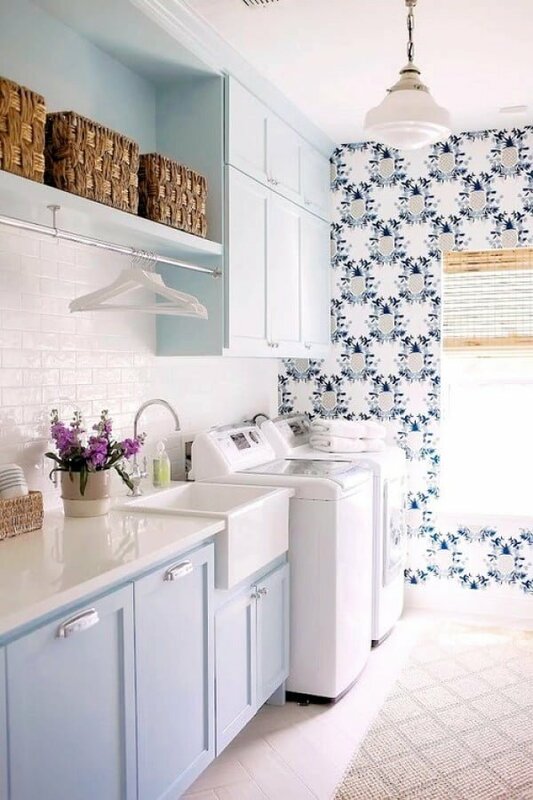 If you like things bright and cheerful, this laundry room décor is a winner. We love pretty much everything about it – the mat, the colored cabinets, the wallpaper, the light fittings, the window, the wooden counter/shelf. And all of the rest! 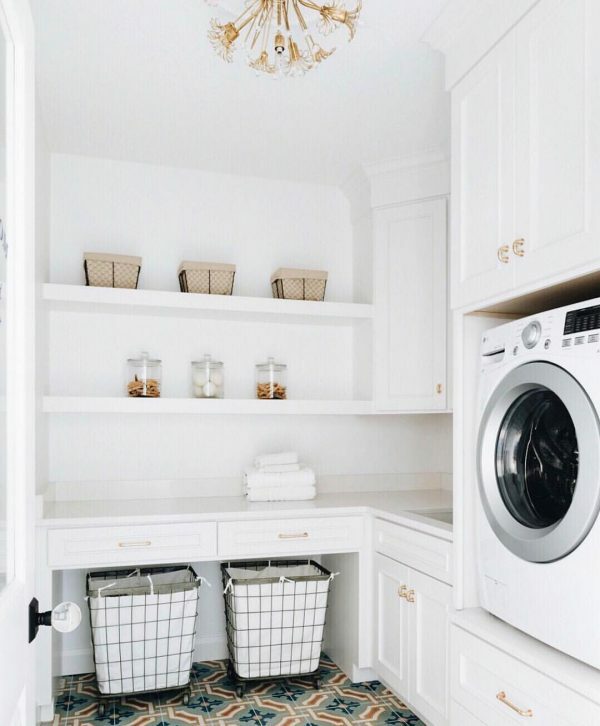 If you want to organize your laundry room some, here’s all you need to know about storage, organization, open cabinets as well as homemade numbered tags. If the previous industrial décor idea was too pronounced for you, you might still consider settling for this one. A nice blend of industrial and traditional with loads of tiny accents and details. 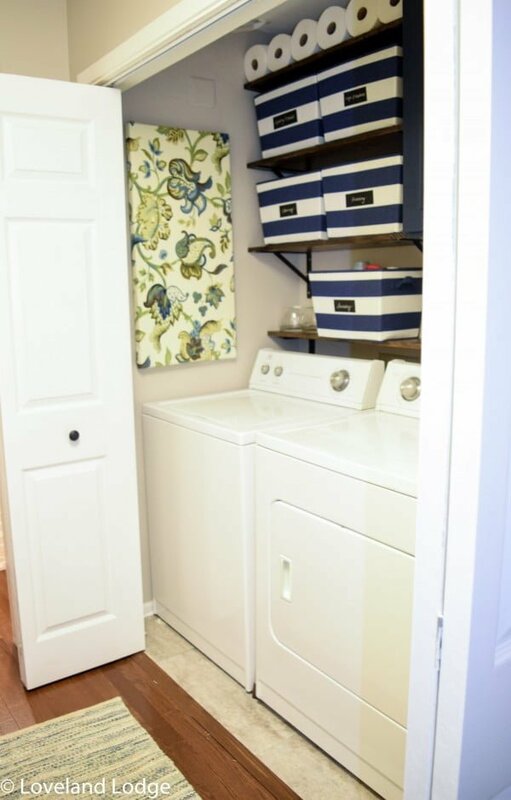 All you need to know to turn your not-so-nice looking small laundry room passage into a neatly organized, good looking and functional space. We particularly like the sliding pedestal shelves used here. 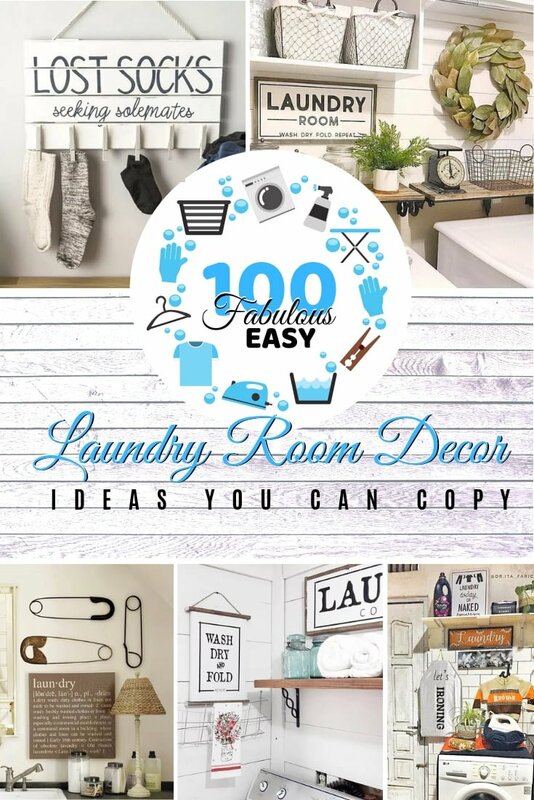 Another great step-by-step guide to DIY your laundry room design. This one has a modern farmhouse feel, but you can tweak around with a few details on the way to achieve a different feel. 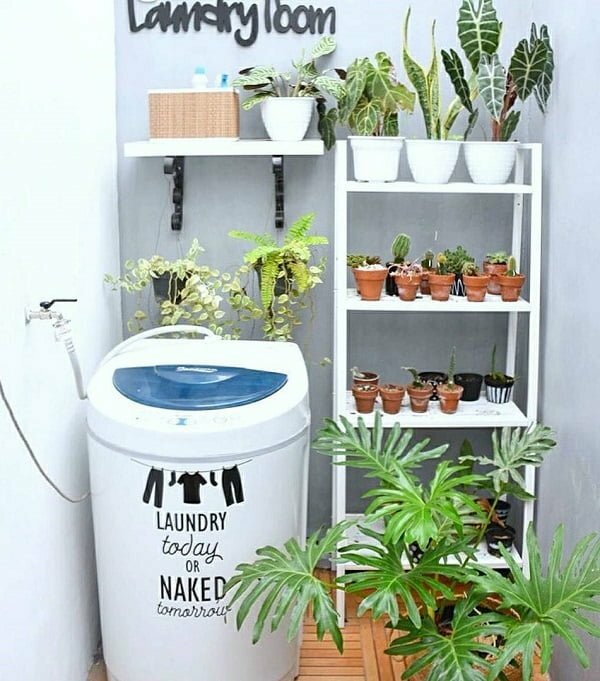 Do you by any chance want to flaunt your laundry room? 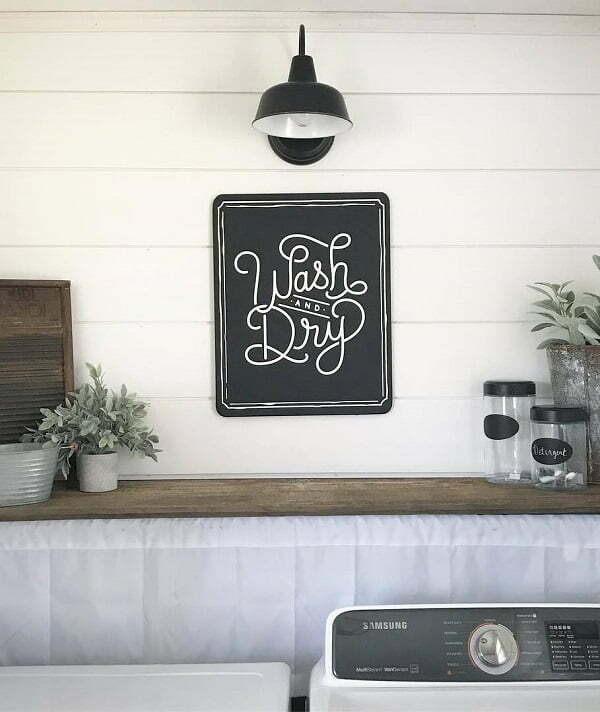 If the answer is yes, nothing better than creating a monster laundry room sign. Check this thread out to know how. This one is a mishmash of industrial, rustic and other details, but we love the result. 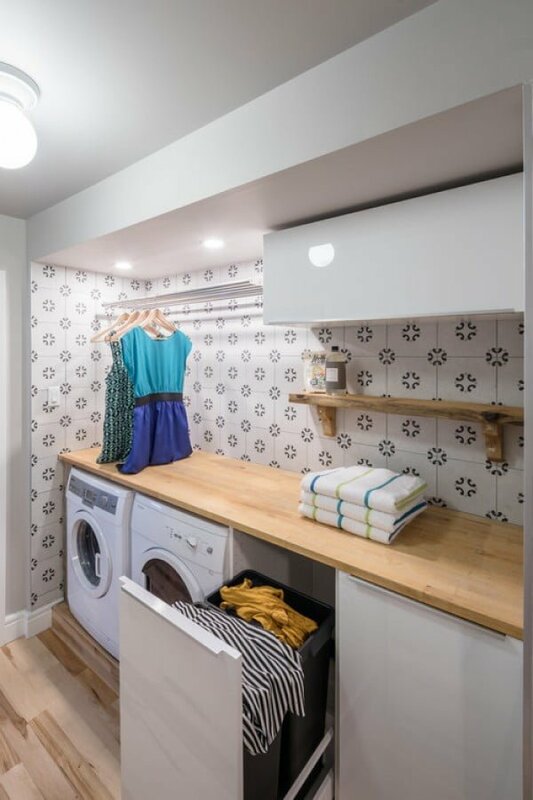 Also shows how great built-ins can be for your laundry room. 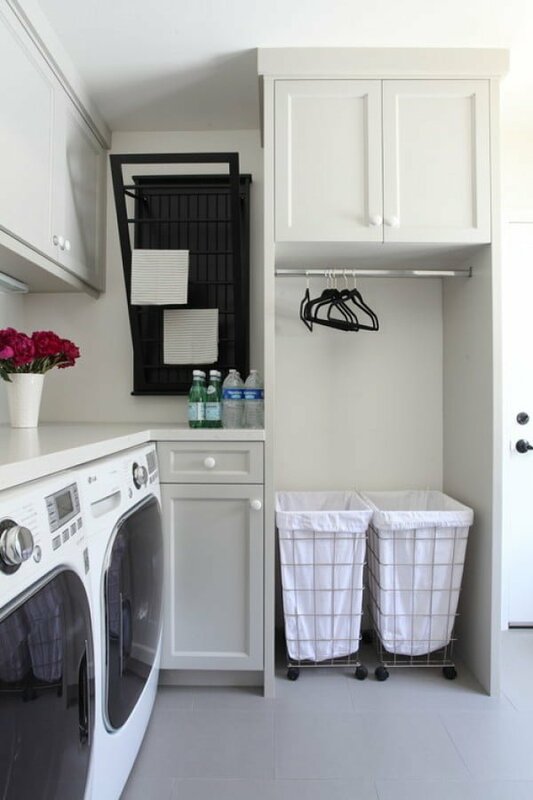 An excellent post for anyone who wants a makeover for his laundry room without having to splurge on it big time. A nice and simple idea with a great result. 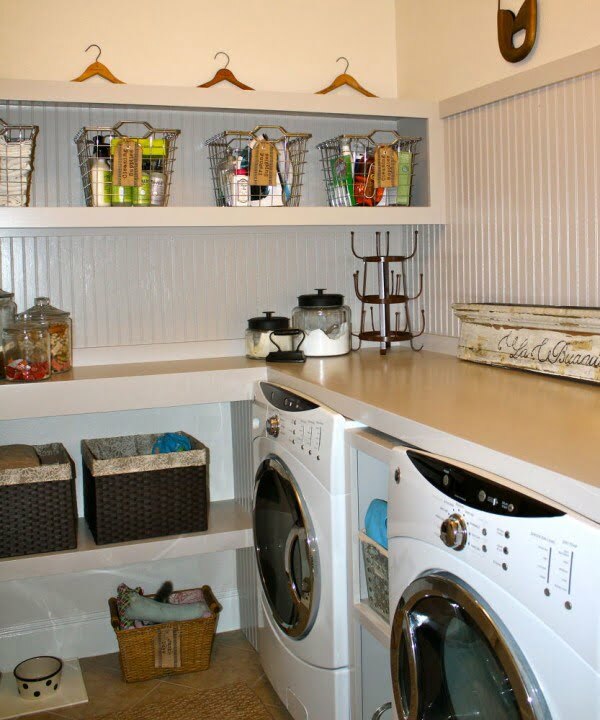 Another excellent makeover idea to get your laundry room décor fall in line with that of the rest of your home. We particularly love the bit about replacing the carpet with hardwood floor. 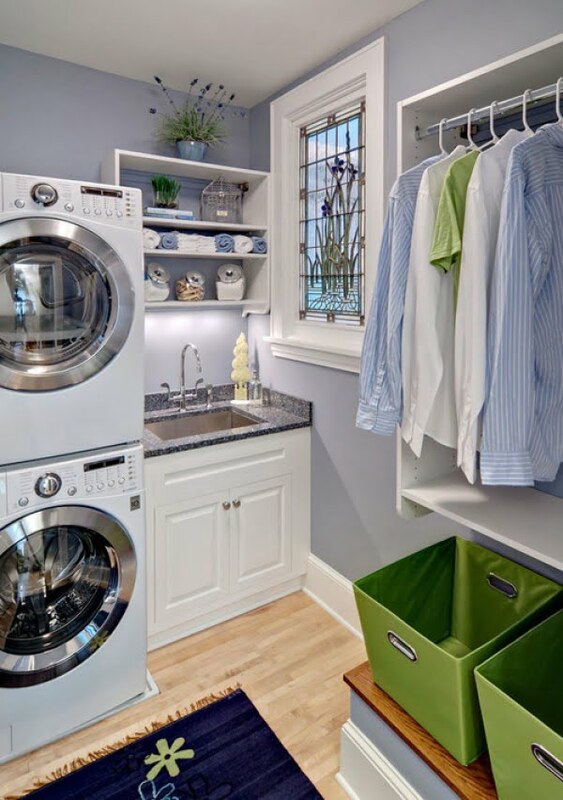 This one is an excellent example of how to make even the smallest of spaces work for you as a convenient laundry room. 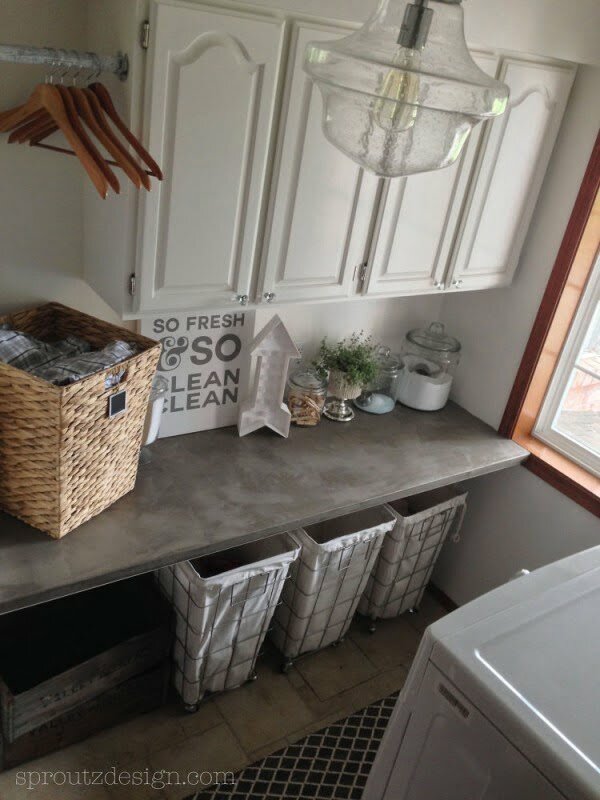 Notice the adequate storage, hanging space and the nice counter. 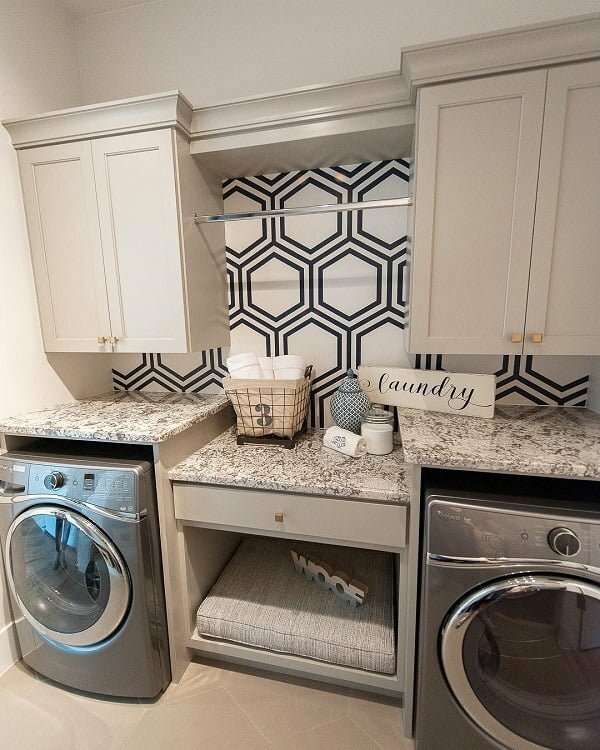 We love the uniquely uniform storage pattern of this idea. 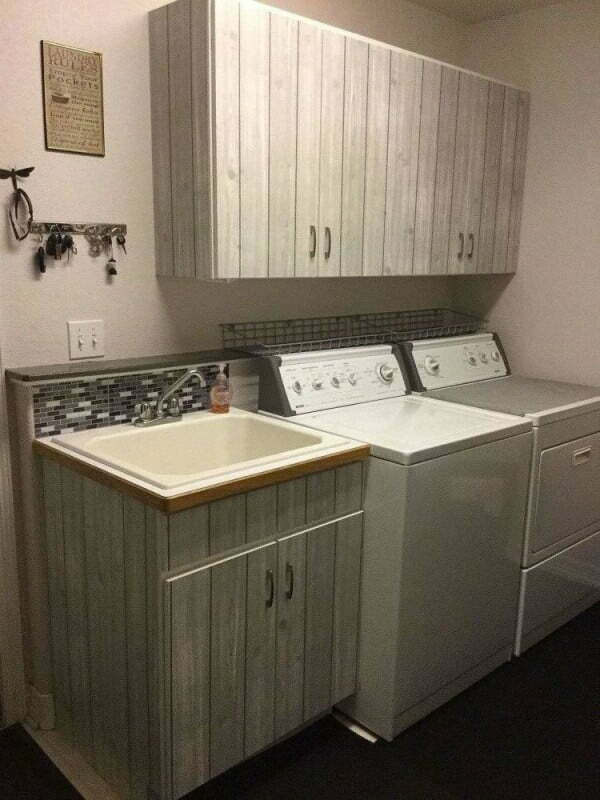 Also that you still have enough space to hang a ‘Chores’ plaque and a giant bulletin board, to boot! Whites create the impression that the room is more significant than it is. 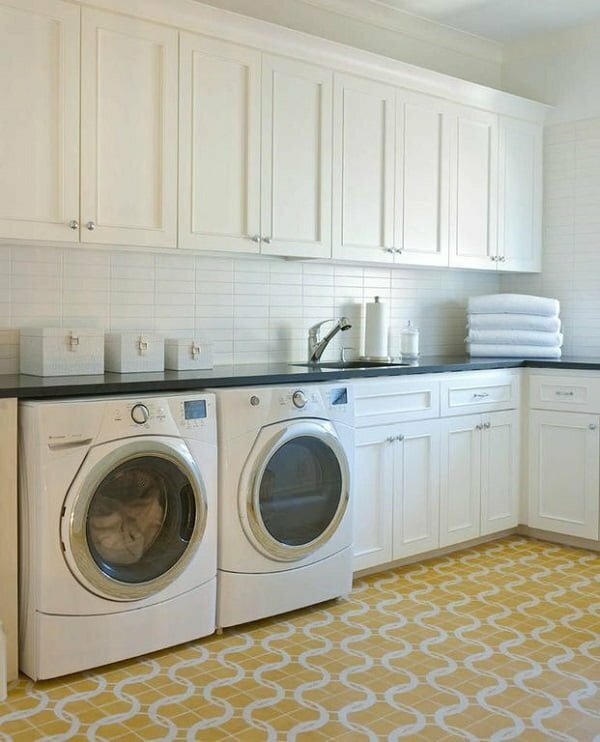 Combine this coloring with textured tiles to give your laundry area a classic look. The symmetrical arrangement of the lower cabinets further refines the overall look. 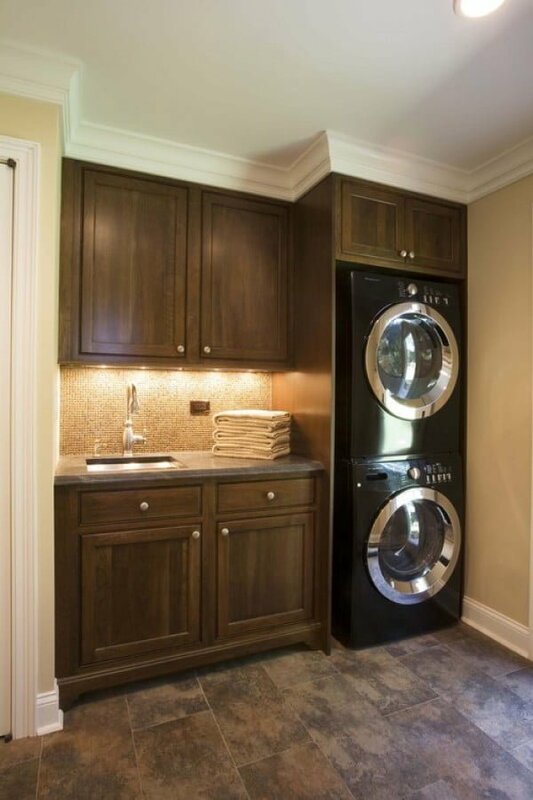 Transform your laundry room with these elegantly raised panel cabinets along with a practical workbench. 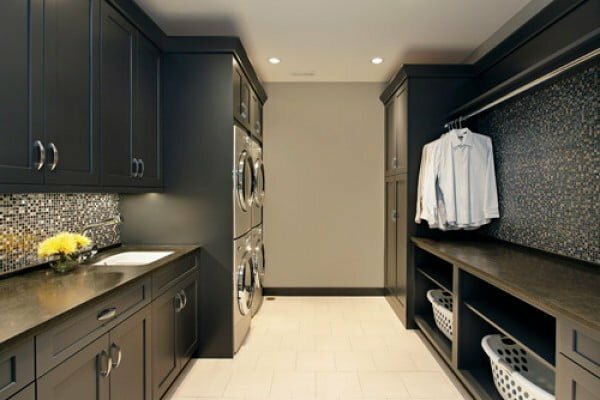 This feature allows you to maximize the usage of your closet area especially. 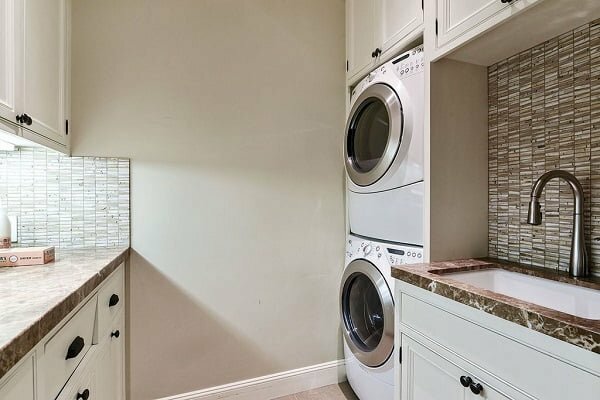 Turn your laundry room into a work of art by applying this combination of shaker cabinets, white cabinets, and multicolored walls. 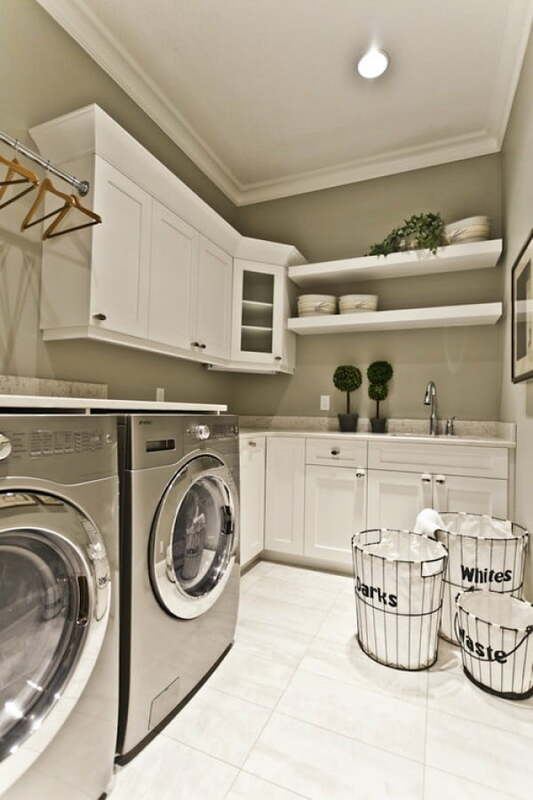 The white cabinets are designed to fit your washing machines and laundry carts making the whole setup look neat. 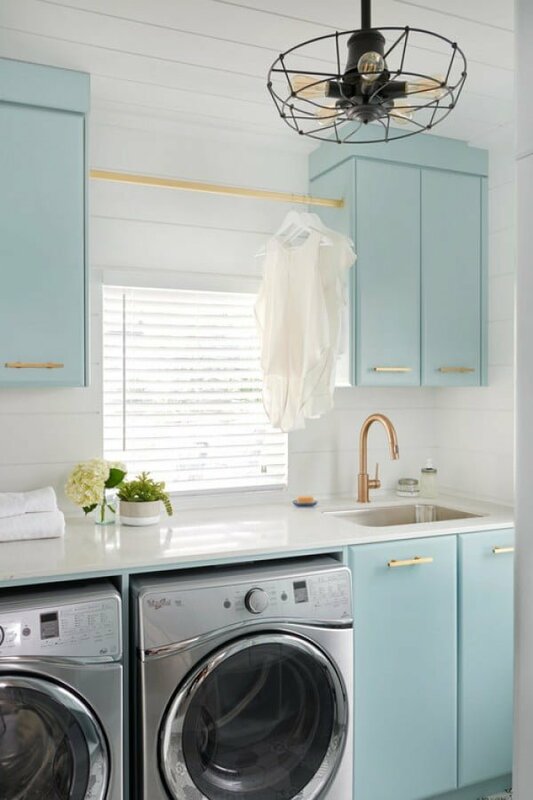 Add some style by adopting this great combo of traditional shaker cabinets, white cabinets, light blue walls and a stacked deck for washer/dryer. Combine this with glass mosaic or Maserati pelican tiles for classic beach style look. 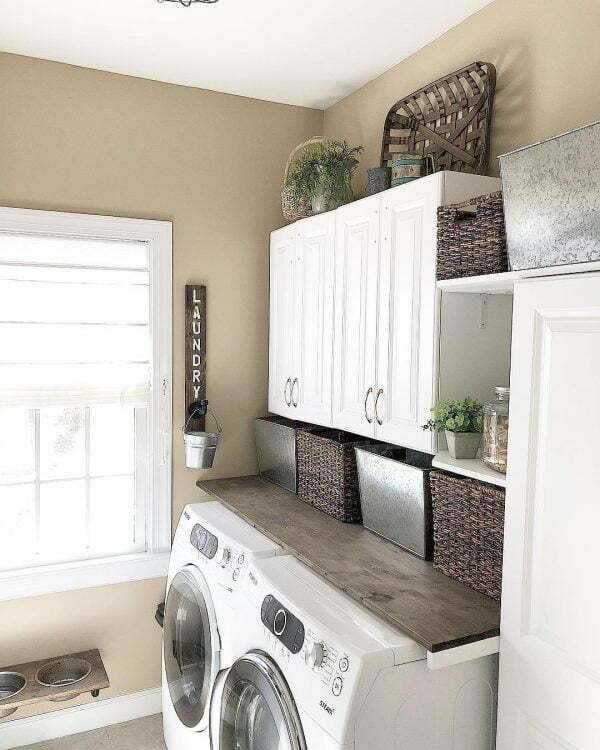 The trendy stacked washer/dryer arrangement is ideal when you have limited space to work with. 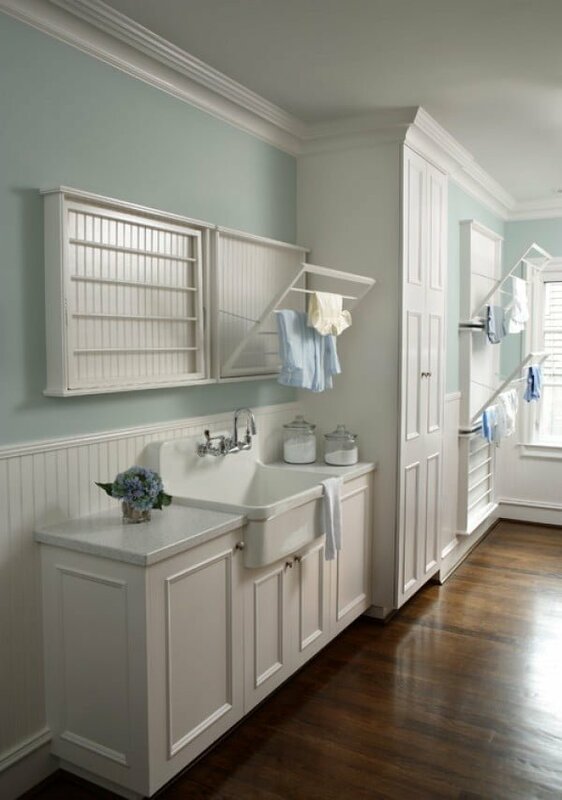 Stack your towels on the countertop shelves or the under the functional Cubed cabinet complete with mounted iron board. 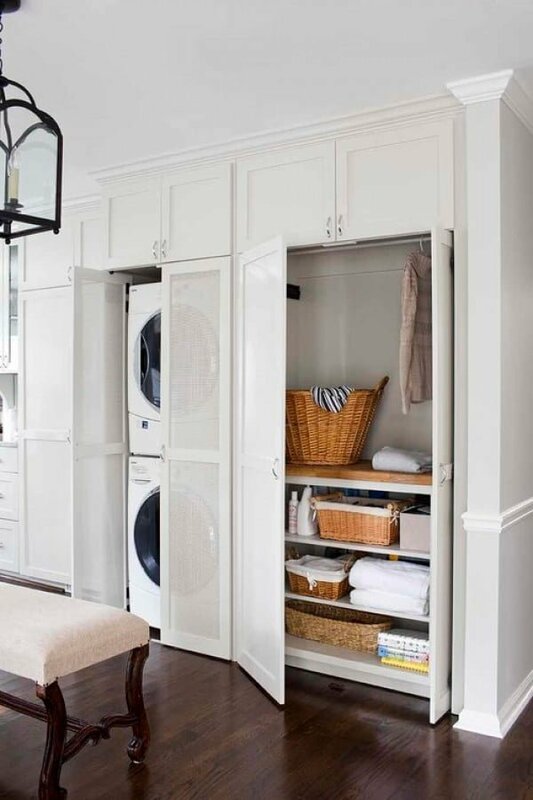 This laundry project approves that you don’t need a ton of space to have a lovely laundry area. The rollout shelf can be used for both ironing and folding. 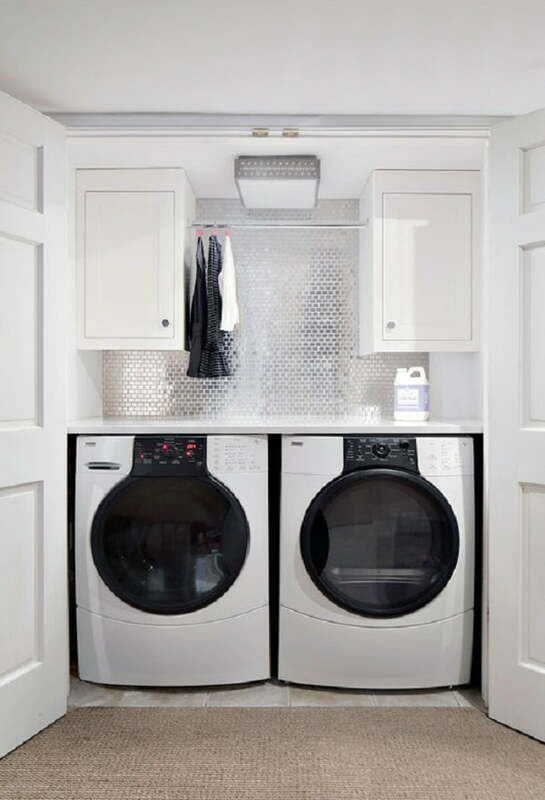 Combine this with the porcelain floor, stacked dryer/washer arrangement, and grey walls for a classic industrial look. 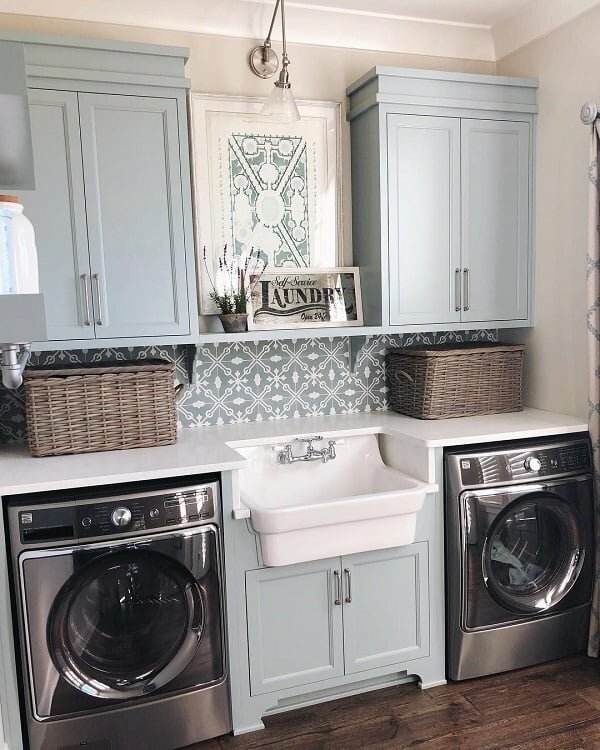 Inject crisp, color and fun into your laundry room by pairing a white wall with light blue cabinets, shaker cabinets, and the iconic farmhouse sink. Instead of tiles, you can opt for a patterned wallpaper to create visual appeal. 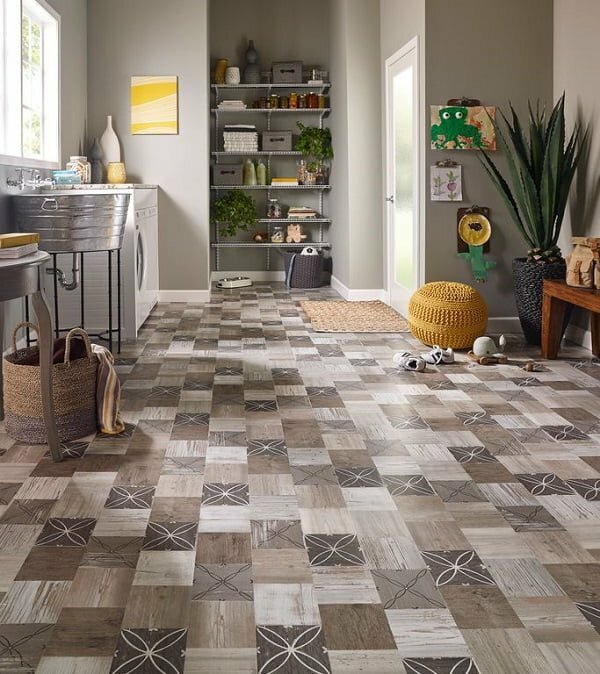 The hallmark of this design is the elegant galley ceramic floor. The pattered tiles create a beautiful accent in the wall background. 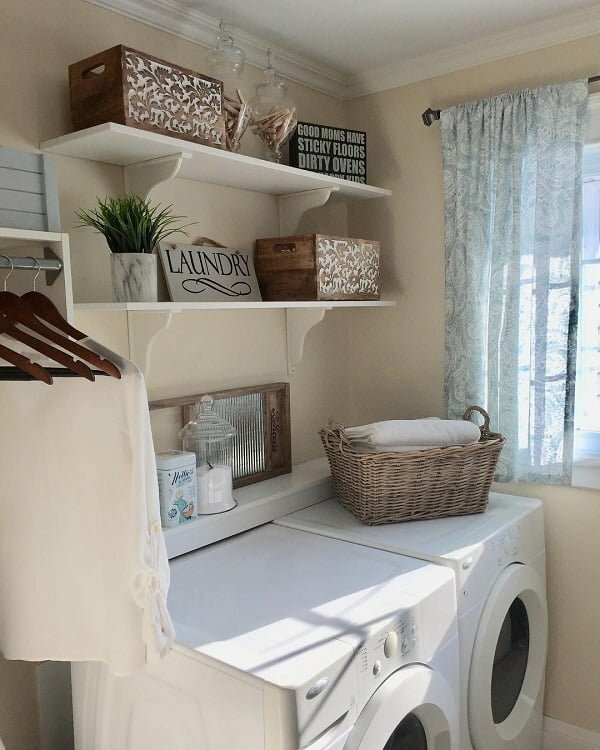 The horizontal arrangement of the washer/dryer creates a neat and ordered look. This one keeps things neat and simple. Decorate your walls with decorative tiles. The wooden solid state cabinet can double up as ironing and a folding area. 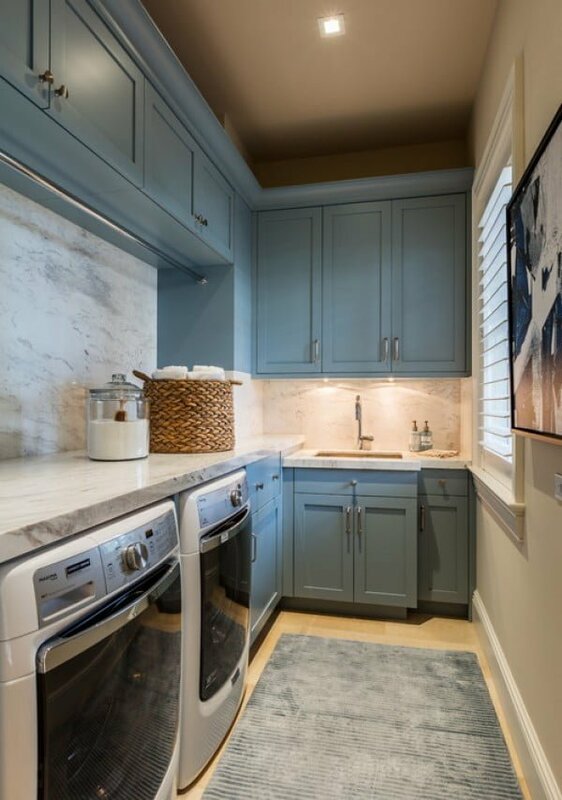 Create contrast by combining white walls and cabinets with a coastal galley slate floor. 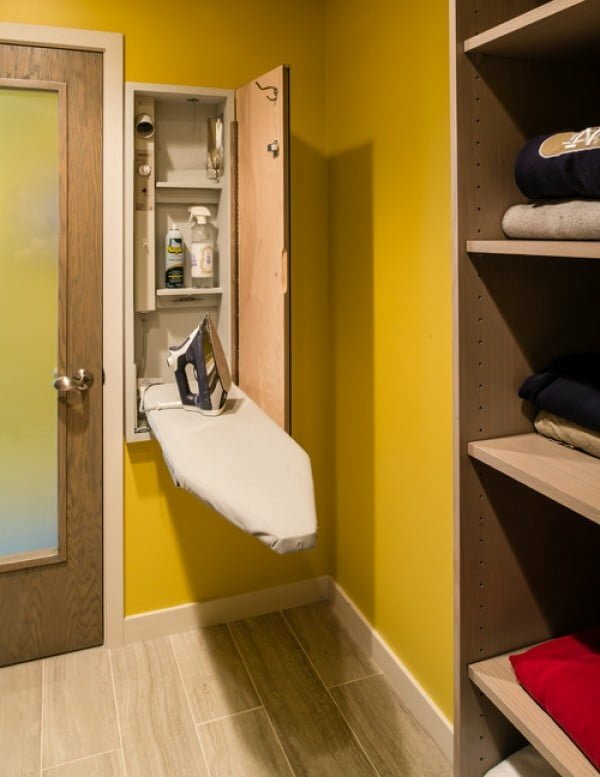 The large custom lockers complete with cushions ensure you have adequate space to stack your belongings. 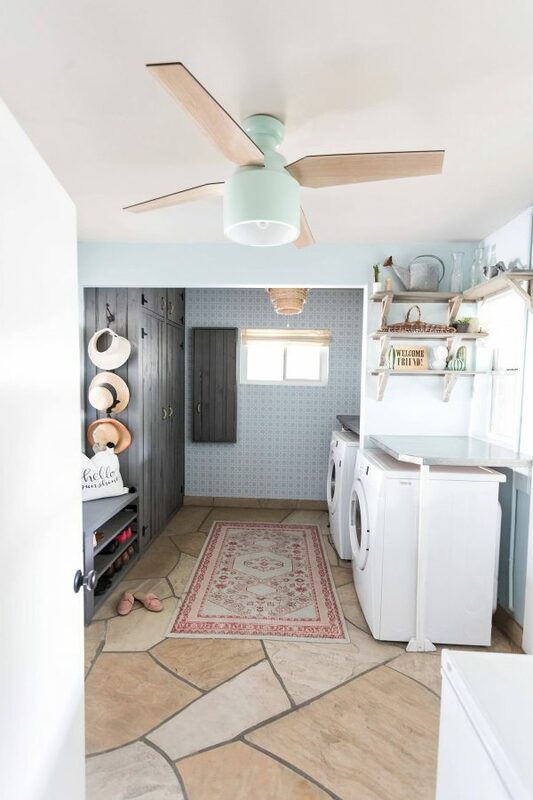 The ceramic floor and the bare turquoise walls add a touch of country to this otherwise practical laundry room. The flat panel cabinet promises to offer plenty of space to keep your linen boxes. 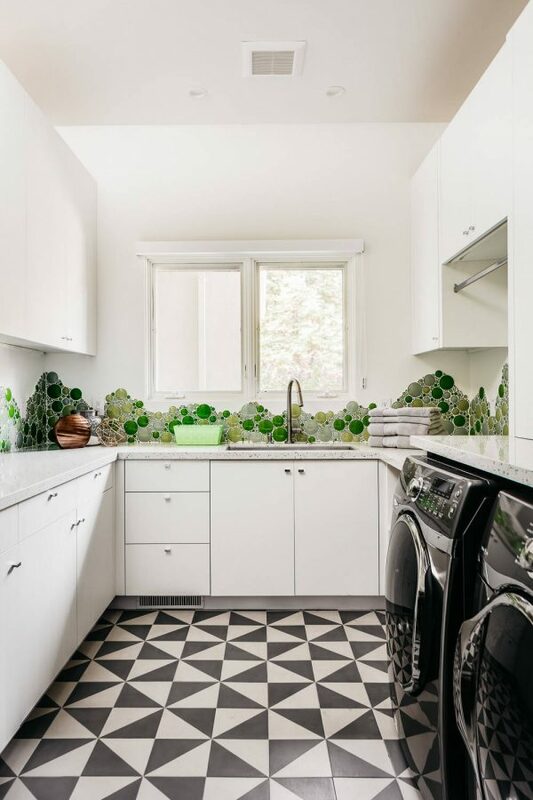 This fusion of monochrome walls, cabinets, and a marble countertop is stunning yet simple. 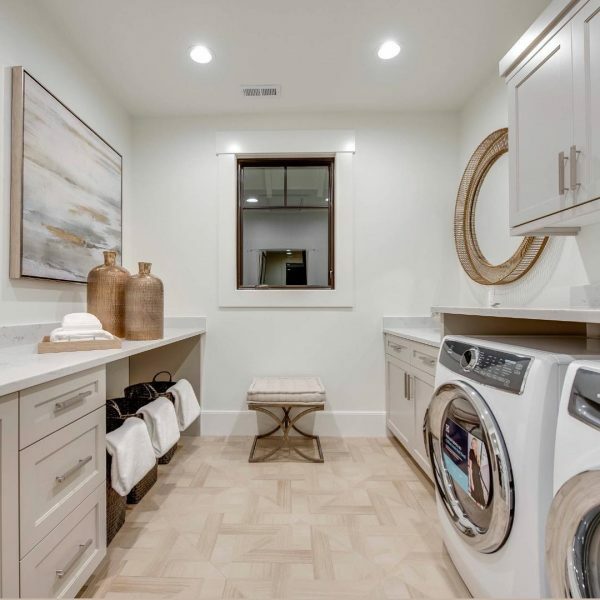 The modern kitchen faucet coupled with the fold out ironing board is another highlight of the contemporary laundry room. 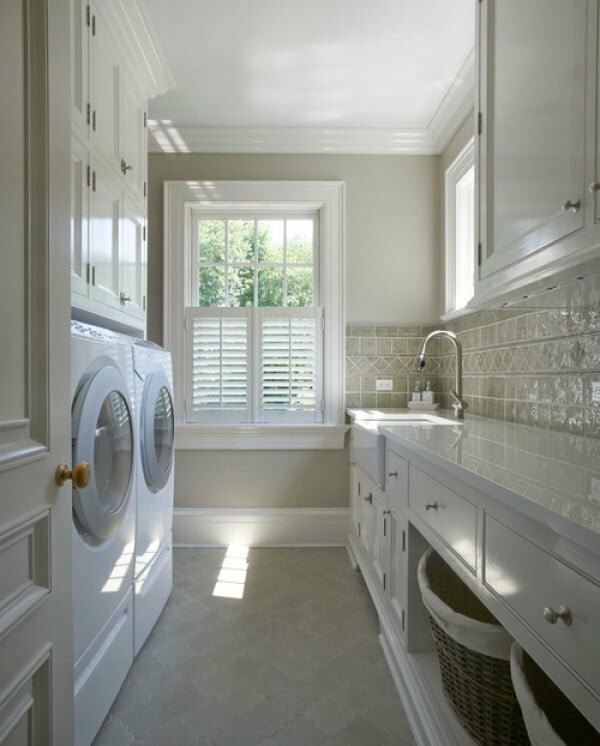 Breathe life into your laundry room by installing a marble countertop, blue cabinet, beige walls, and a traditional light wood floor. The shaker cabinets should be easy to replicate. 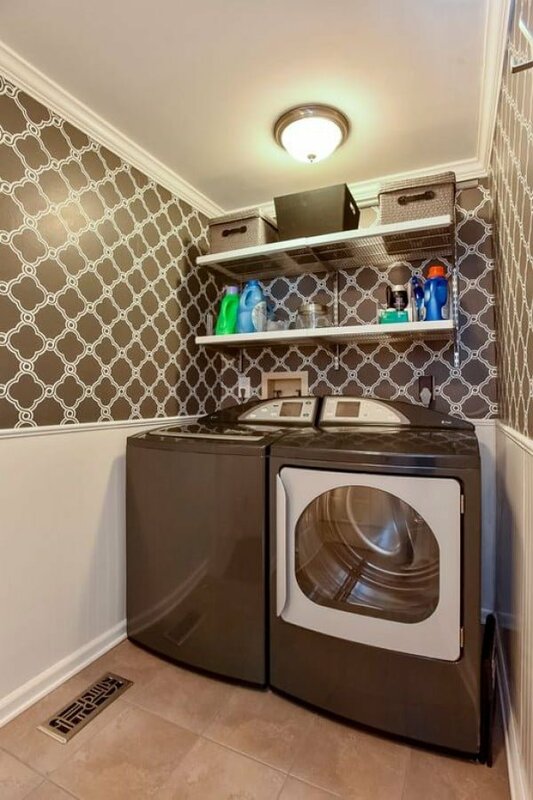 The stacked washer/dryer arrangement never goes out of fashion. Combine it with dark brown cabinets and marble flooring. 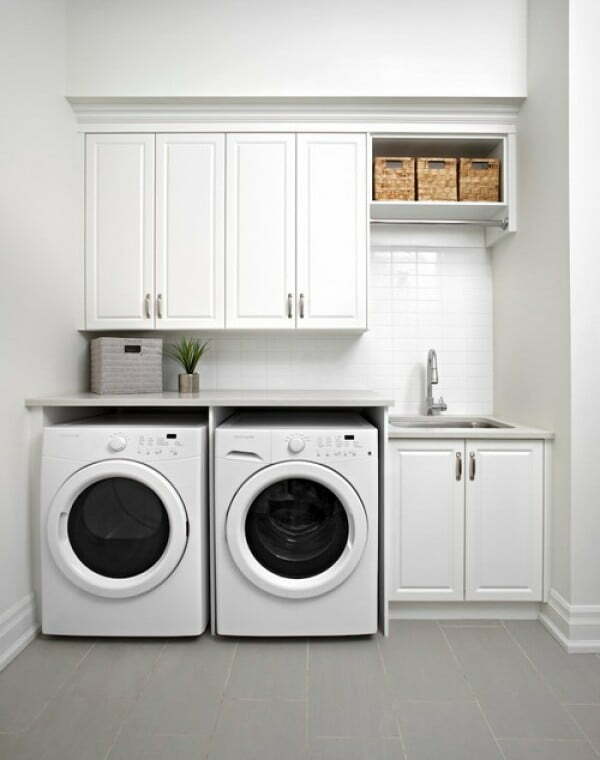 This project is both cost-effective and suitable for small sized laundry rooms. The vertical cabinets are practical and easy to install. 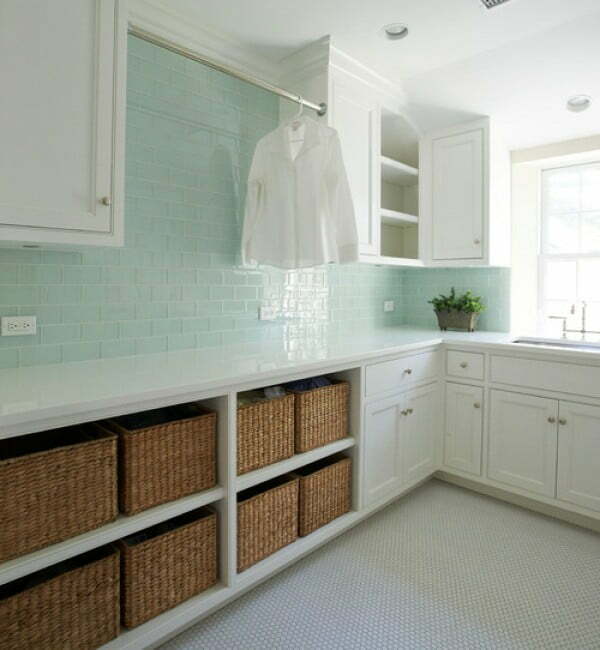 This traditional single walled laundry set up features light blue cabinets that provide contrast to the white walls. The south-east facing windows are bound to let in a lot of light during the day. 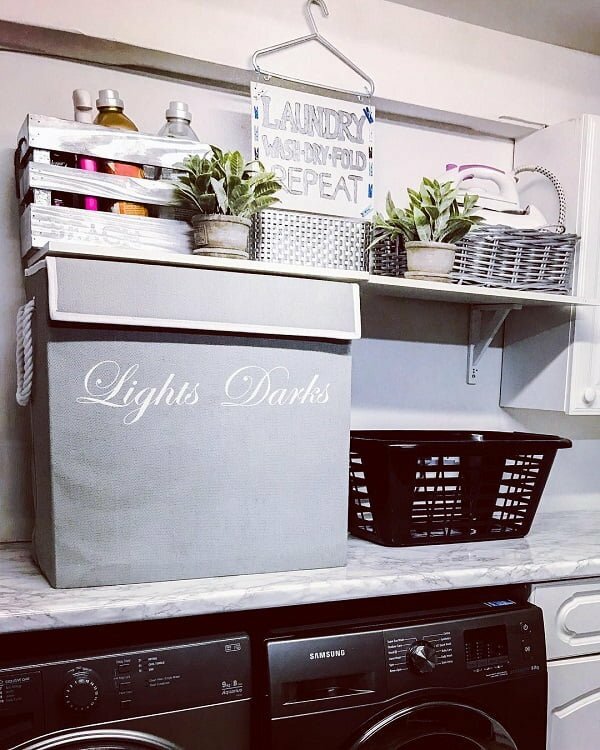 Declutter your laundry area by having these functional laundry boxes. 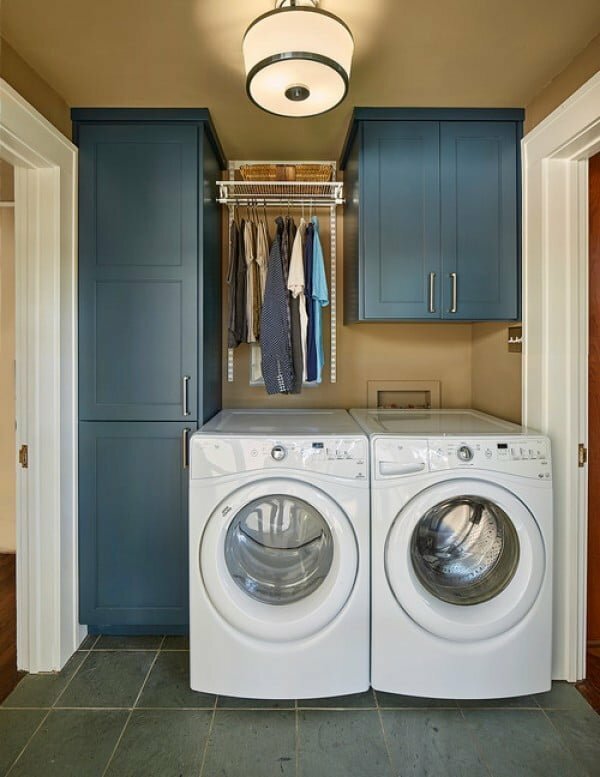 The iconic stacked washer/dryer setup is a crucial feature of this design. The wooden countertop blends well with the monochrome walls and cabinets. 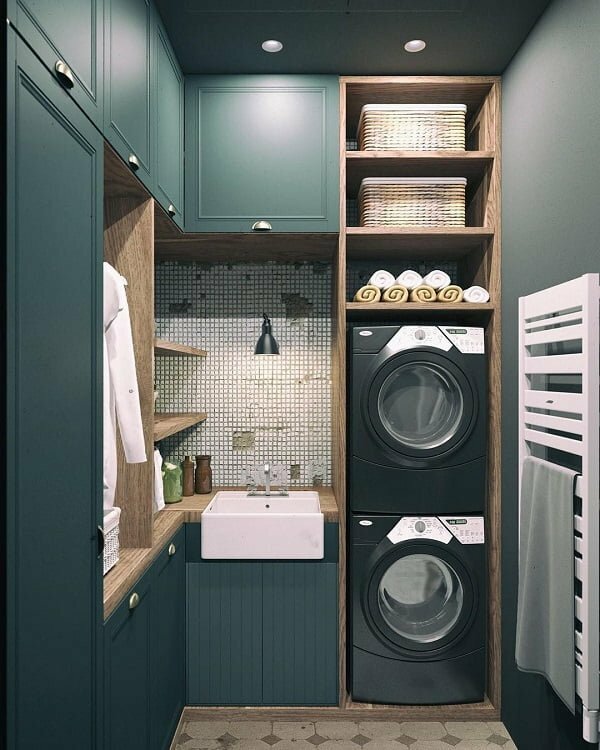 These medicine cabinets will do justice to any tiny sized laundry area. 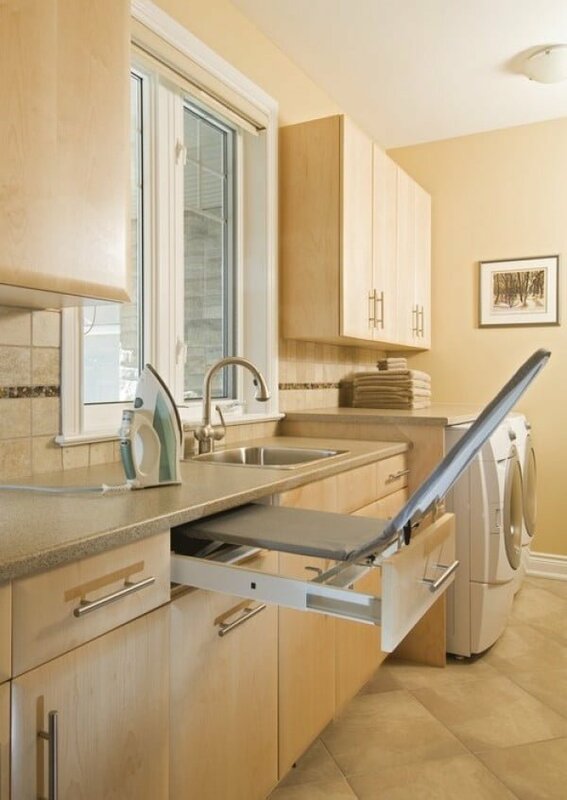 Maximize the available space by having this foldable built-in ironing board. The wall mounted cabinet door hinges to 90 degrees and features a hanging hook. What better way than to have your entire wardrobe visible and easily accessible. 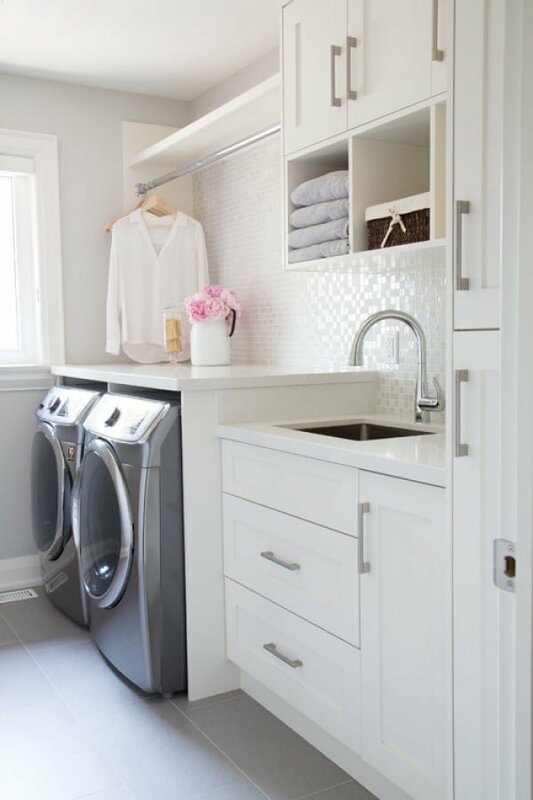 This project features laundry baskets and a stainless steel bar to hang shirts and other linen. The combination of white, vibrant blue and gray color schemes add a homey feel to this setup. 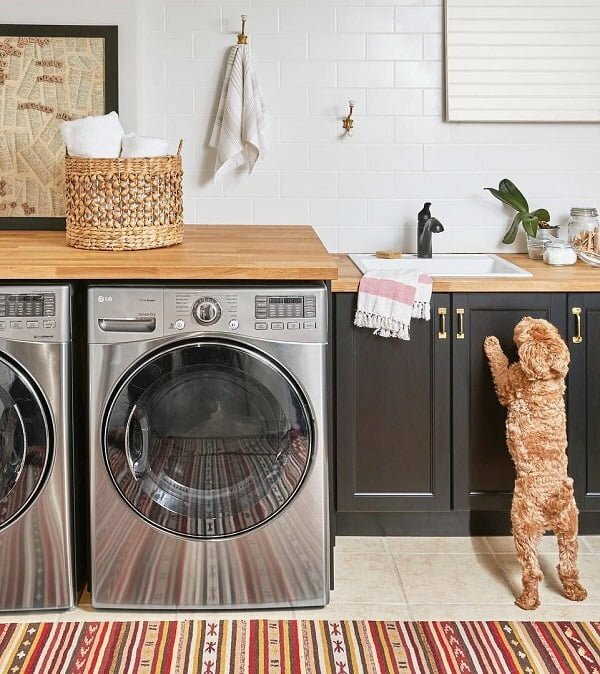 This clutter-free laundry area features overhead cabinets where linen can be stashed away. Break the monotony of a white ceiling and walls by having marble counter tops and ceramic floor tiles. This fabulous space uses plenty of black and white, cleverly enhanced with a section of bubbly green wallpaper. 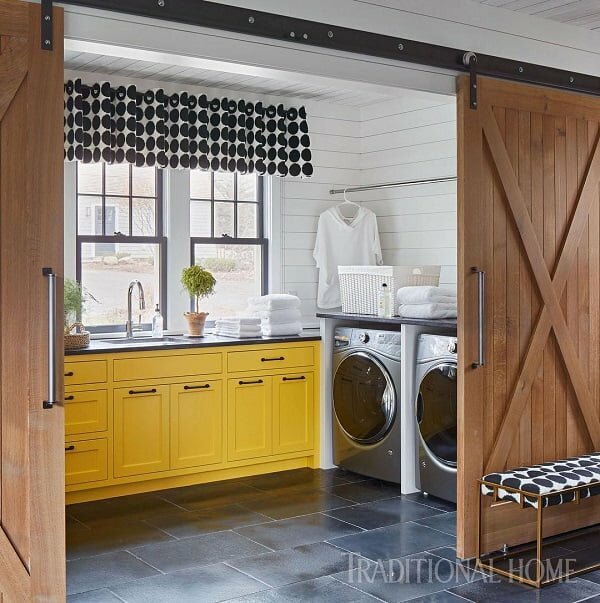 A laundry room designed to match the rustic and modern styling aspect, while using 70s color schemes and a barn door entrance. A sensational blend of white furnishing and appealing wooden details, such as the striking wall sign and intriguing measuring scale. The custom-made black and white wallpaper soothes the ‘white noise’ of this room, making it appear comfortable and multi-functional. 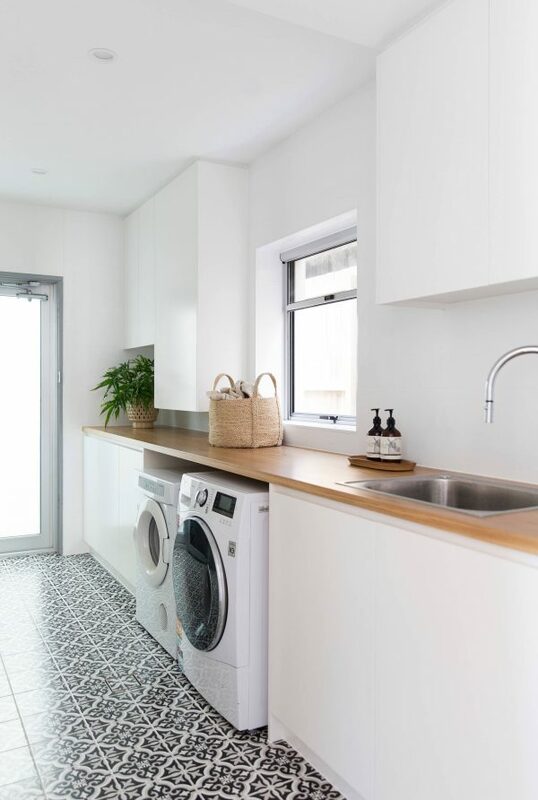 A wise approach to white shading, enriched with luxurious cream flooring and modern-day washing machines. 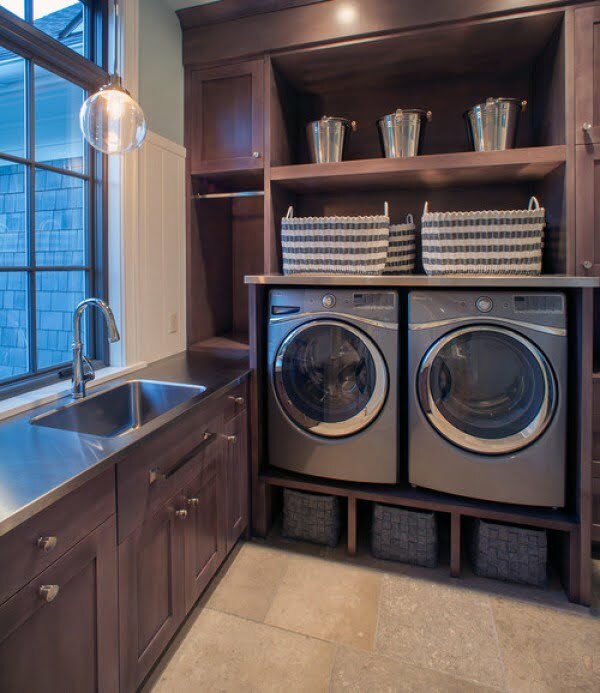 Practical use of laundry space, with a statement glass window and a tasteful mix of wooden patterns. 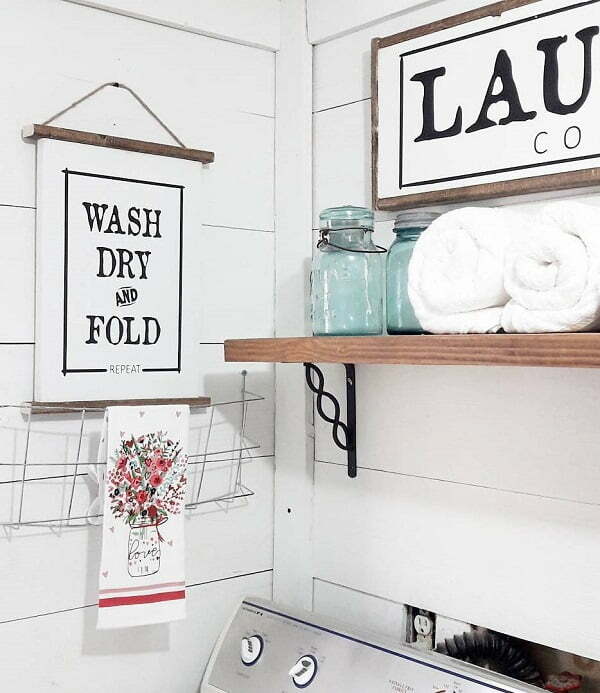 The laundry room mixes grey and white elements, such as impactful wooden photo frames and rural laundry baskets. 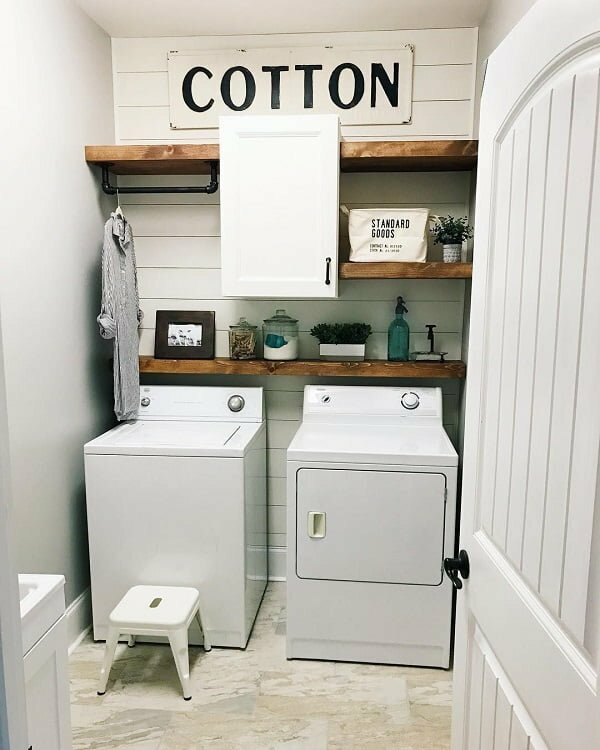 With a country feel to it, this laundry room combines light shades, interesting rustic decor and plenty of storage space. 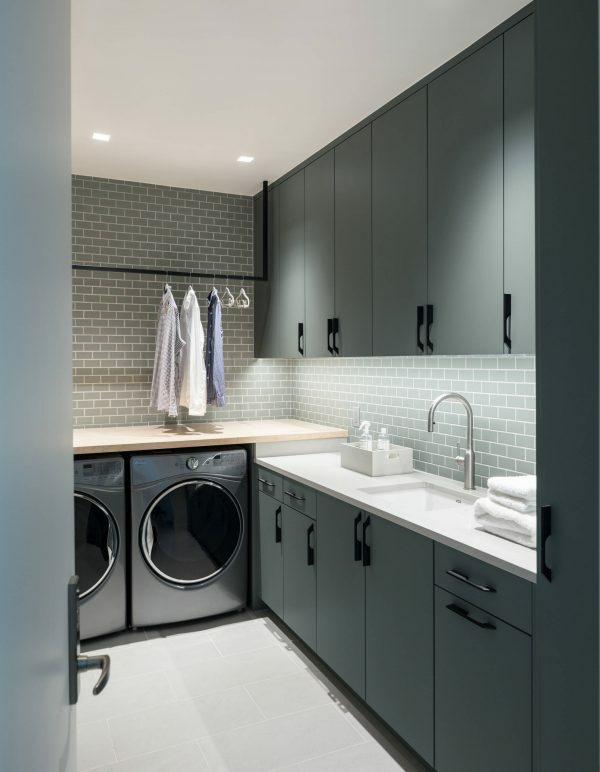 This simplified laundry room explodes with black and white patterned flooring and minimalistic plywood elements. 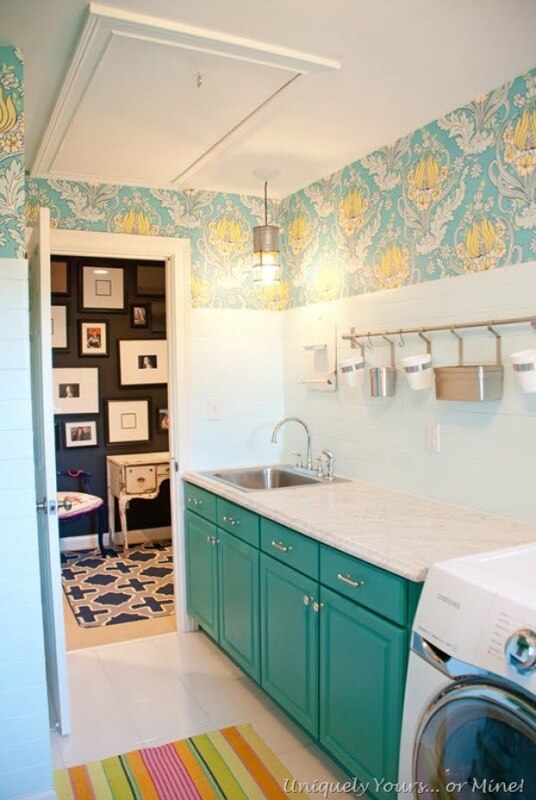 The refreshing blue wallpapers and cool ceiling fan capture an almost tourist vibe of this laundry room. 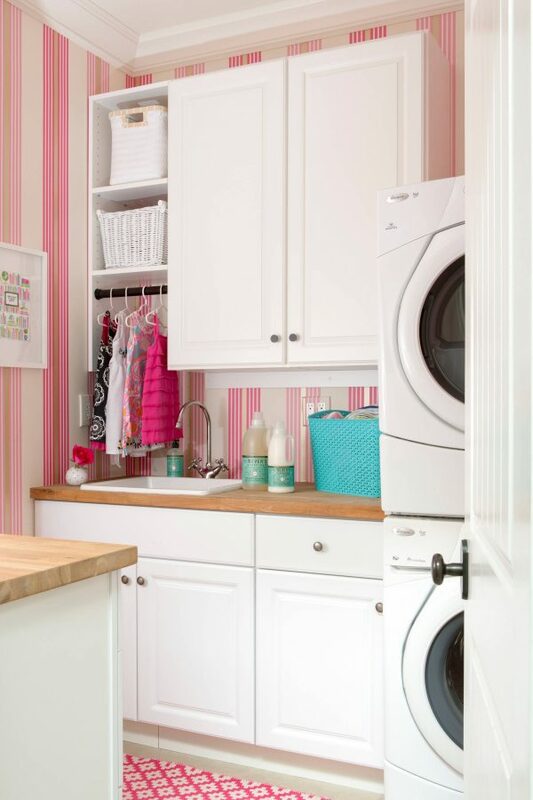 A simplified laundry room, with cleverly used storage space as well as pink wallpapers and flooring, which open up space magnificently. The greyish tones of the room accentuate the statement window and introduce a pop of golden decor elements. 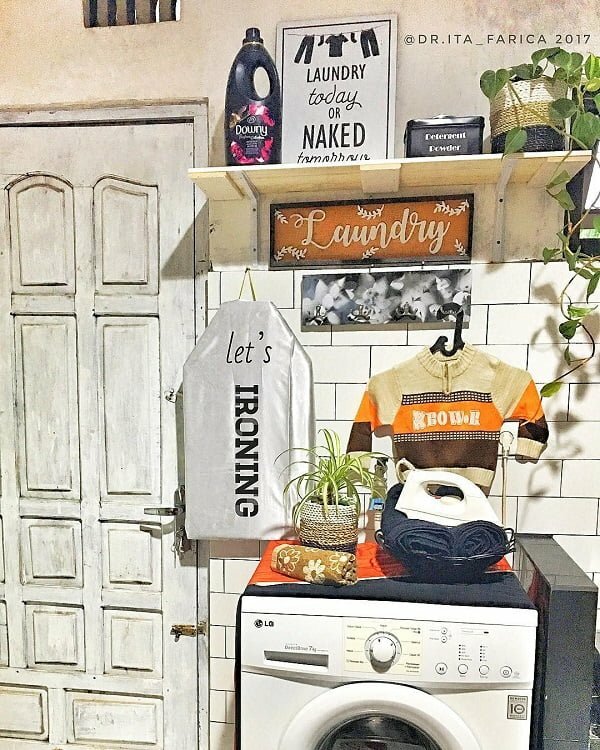 The grey brick wall creates a dimmed atmosphere, using the metal hanger rack as a space-friendly hack. 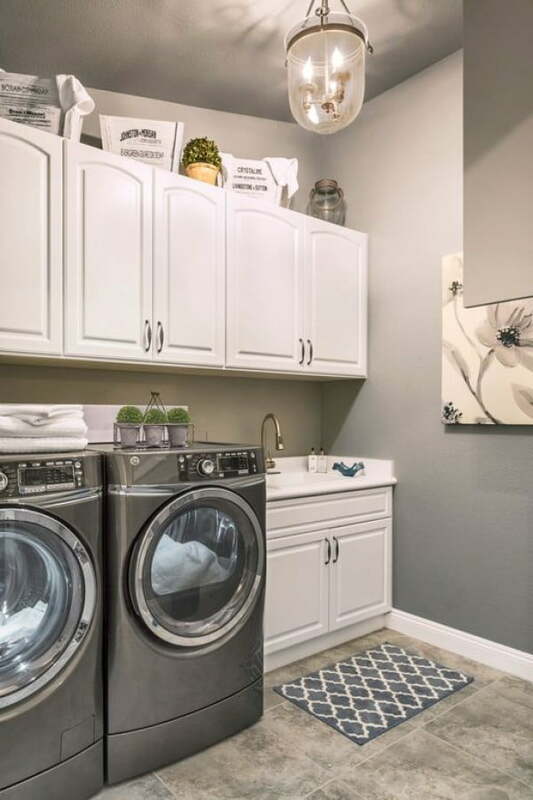 A spacious laundry room, accentuating the patterned tile flooring and a splendid mix of greenery and neutrals. Great use of space which creates a perfect blue-yellow balance and allows ethnic decor elements mash-up. The white tones of this room emphasize the striking basin, polished patterned flooring, and dark wood countertops. The built-in metal shelf complements the dynamic wood flooring magnificently, using pops of color to enhance the space at the same time. 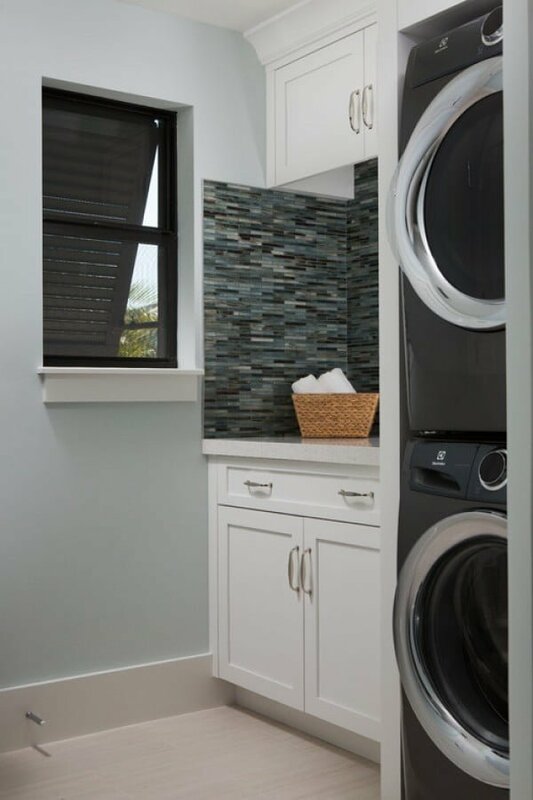 This packed laundry room uses dark marble elements and unsymmetrical white walls to create a more spacious setting. The faux brick wallpaper opens up the room largely, creating a playful blend of wood elements and corbels. This light room uses open shelves instead of traditional cabinets while introducing rustic elements and ornate flooring to balance out the room’s whiteness.